Saying thanks is hard to do. You want to give more than “Thanks” and there’s a lot of space inside those blank cards. 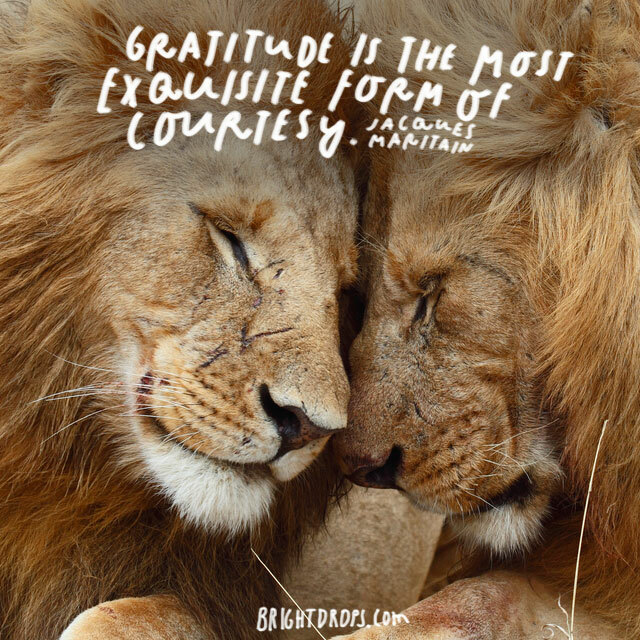 This collection of quotes will give you something to fill up some of the space and get you on track to showing people the proper amount of gratitude, without sounding cliche or cheesy. This is a great way to start our list and a great way to say thanks. Showing someone how grateful you are can help them be more grateful in small things. 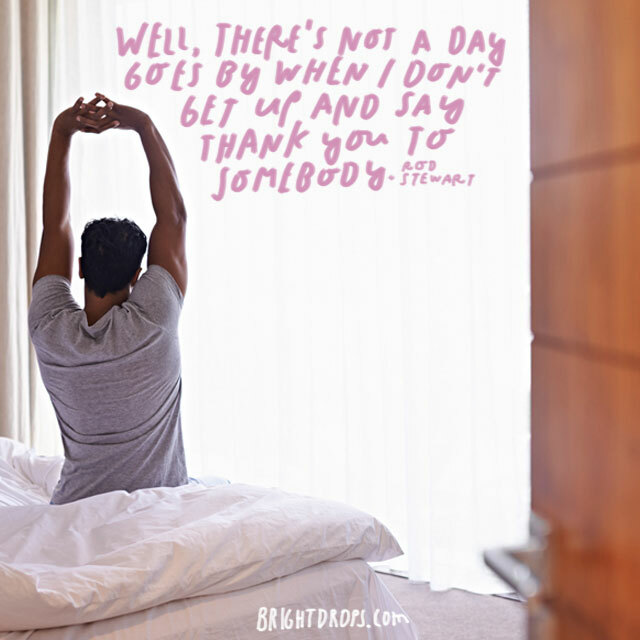 Whether they bought you lunch or just covered for you at work for 5 minutes, this is a great catch all quote to make gratitude a habit rather than a chore. 2. 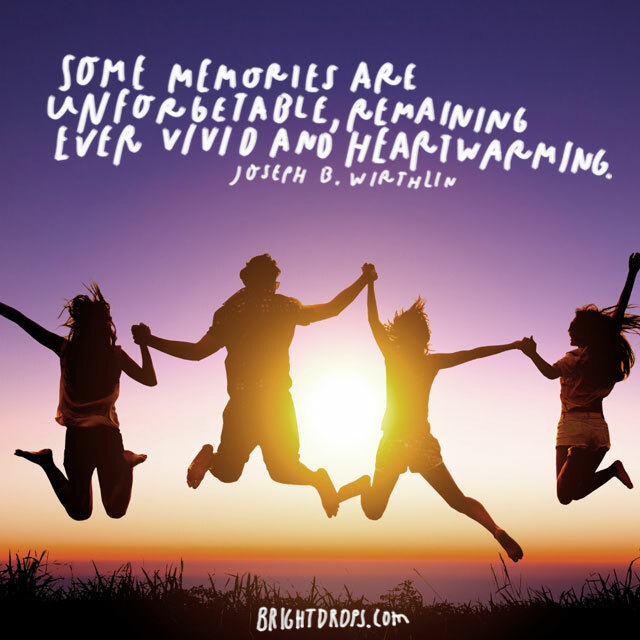 Joseph B. Wirthlin on Memories. When someone goes out of their way to help you out, it’s hard not to say thanks. Sometimes we need to let them know that what they’ve done will be remembered forever. People don’t realize that some of the smallest things they do make a huge difference in our life and our livelihood. Even if it seems small, make the thanks big. 3. Eric Hoffer Is Bad at Math, Too. Letting someone know that you consider their very presence in your life a blessing can go a long way to boost their confidence and their role in your life. If they feel that they are appreciated, they will feel no apprehension in building a real relationship with you. The base of all relationships are built on appreciation. 4. 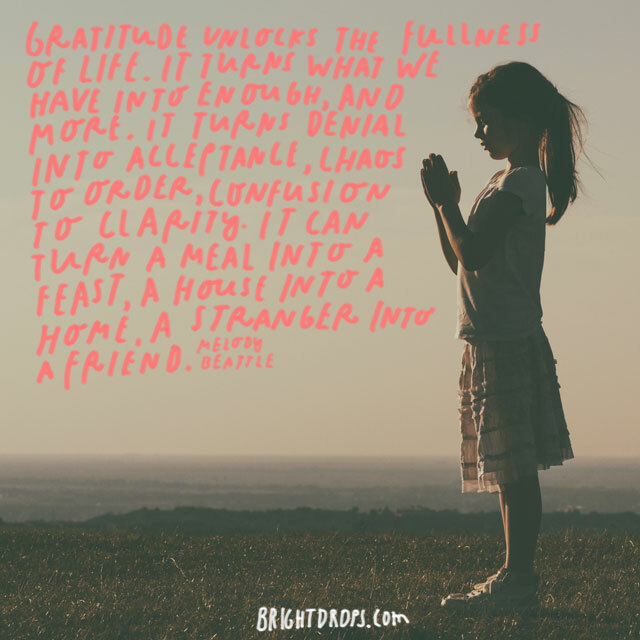 Melody Beattie Explains Gratitude. Building a relationship with someone involves letting them know that you appreciate everything they’ve done for you. Most of the time that includes being there just to listen and participate in conversations. If you let people know that they have served you well in your life, they will continue to serve you well in life. 5. 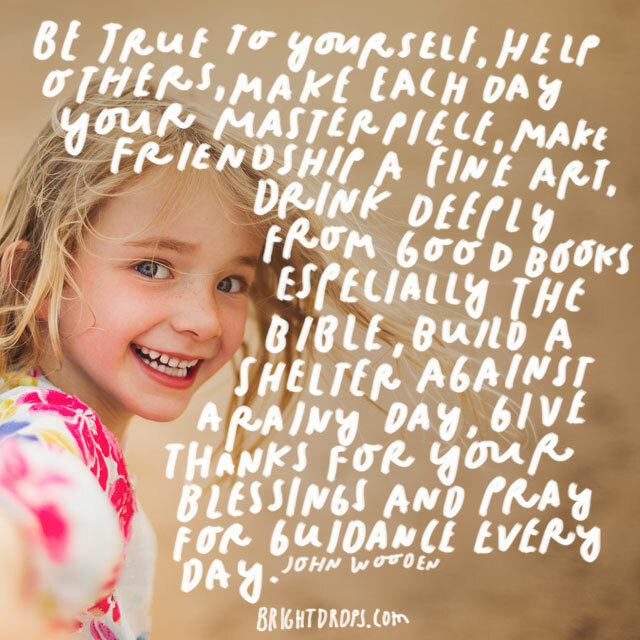 John Wooden Is Thankful for Each Day. Use this as a way to say thank you to a blossoming friendship. As we go through life, it is common to see a friendship evolve from practically nothing. Suddenly, you realize that someone is becoming one of your most trusted friends and someone you think about. Let them know that they are part of your routine. 6. Meister Eckhart’s Prayer of Brevity. 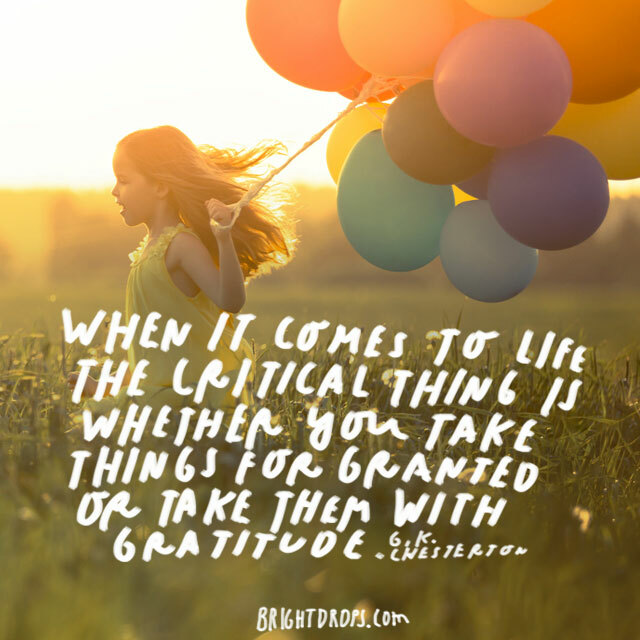 So often we complicate gratitude. It is enough to say thank you. The fact that you’ve gone out of your way and found a list of quotes to weigh out which one is right means that you are truly appreciative. Find a way that fits the occasion and let the person know you are grateful. This is the perfect way to say thank you. Sometimes, a simple word of encouragement is all it takes to get us going. We feel like we’ve lost our mojo; we’re just down in the dumps. Then someone comes along and gives you a new perspective and a renewed vision in life. 8. Henry Ward Beecher on the Fairest Blossom. Sometimes, it’s good to use a quote in the blank margins of those cards. Here’s a great way to fill that space. 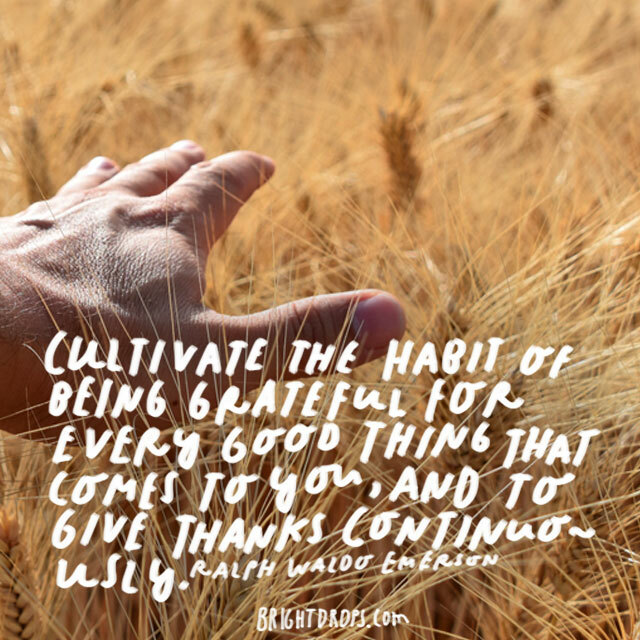 Help others create the habit of gratitude by offering them some of these quotes as a motivator for their own positive change. It’s also a great way of seeming too cliche. 9. Karl Barth on Joy. Sometimes the best way we can show that we are grateful is to be happy with what the other person has given, whether it be a tangible good or just emotional support. If you know it is someone that expects a thank you card, this is a great quote to cover yourself so they don’t question why it took you three weeks to get a card in the mail. 10. Melody Beattie Can See the Future. 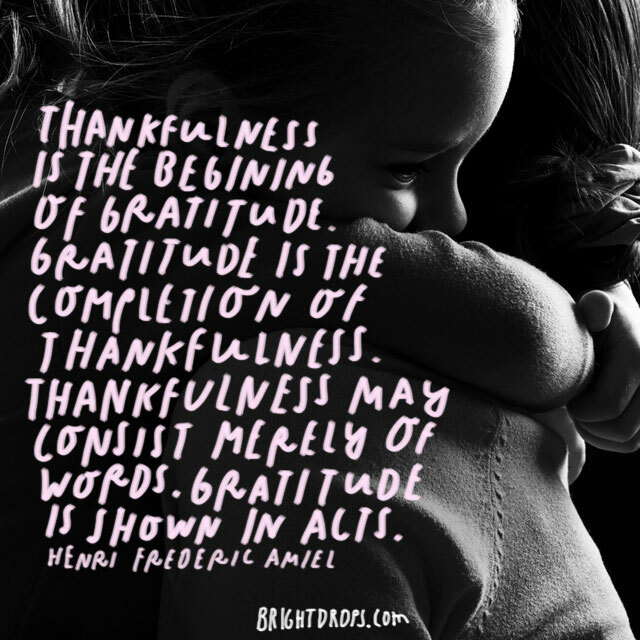 Being thankful can help us frame things as they occur in our lives. If you have a grasp on what you’re grateful for, you can better understand how everything has a time and a place. The seasons seem to flow more smoothly from fall to winter and winter to spring. 11. William Arthur Ward Can’t Wait for Christmas. If someone is a bit confused about why you might be handing them a thank you card, this is a great quote to include. You can simply offer up that you are grateful for some little thing or a few little things that they’ve done. Those things are as small as they were big to you. And hiding that gratitude is like wrapping a gift and hiding it in a closet. 12. James Allen Fulfills His Duty. When people expect thank you cards (like after a wedding or a birthday) this is a great quote. That way, the person doesn’t feel that you’ve only sent this because you had to. Instead, they realize that you are fulfilling your duty. Just be sure to include that you honestly appreciate the gift. 13. Jean-Jacques Rousseau Writes a Check (or Cheque in the UK and Canada). Another great way to mix it up on a stack of thank you cards that must be finished. Send this one to your rude uncle that you know just can’t wait to keep score with the thank you card. This is a great way to say thank you in a sincere way, but still get one over on those friends and family you know are keeping score. 14. Aesop Always Has a Moral. This is a great quote to fill those cards up. It helps if you have a few of these quotes to help you get through a stack that don’t require a ton of personalization. A good quote always seems more valuable than remembering the exact toaster that you got from Uncle Larry. 15. Cicero Has His Father’s Virtues. 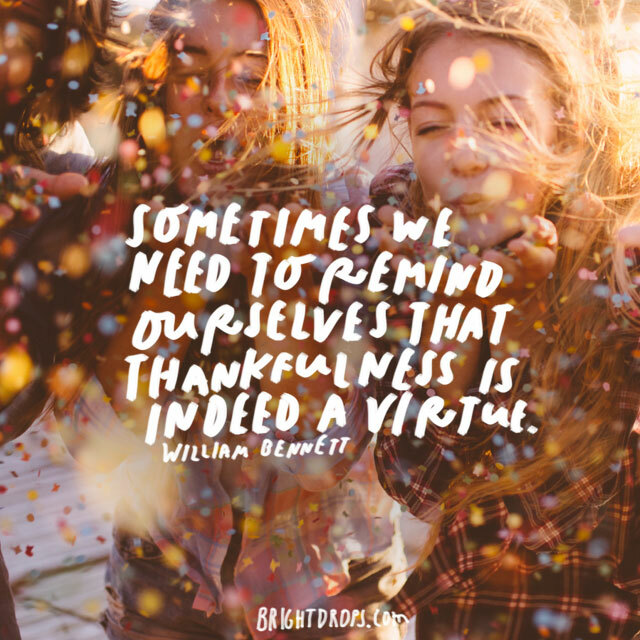 A thankful heart is the start of virtue. Showing your gratitude is a way of showing that you have values and that you value the thoughts and feelings of those around you. It is a great way to express that you are a noble and good person. 16. Alan Cohen and the Highest Prayer. 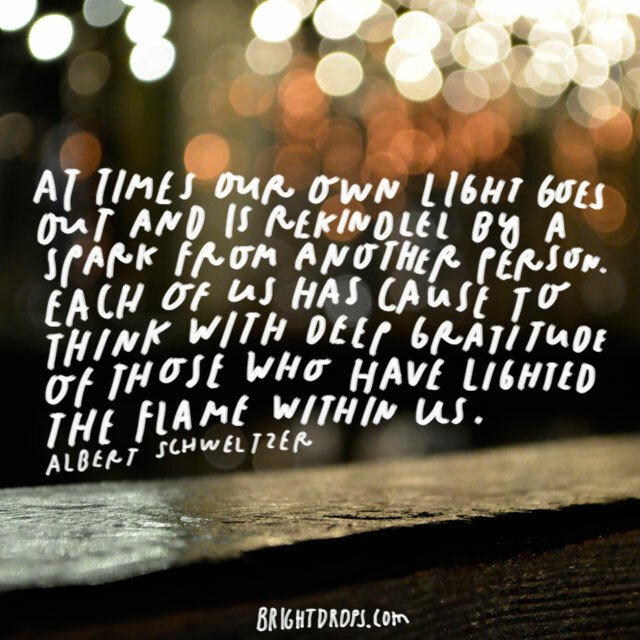 Showing and saying thanks is a way of acknowledging that this person has been a source of light and joy in your life. Let them know that they are indeed an answer to prayers in a sense. They have helped you see that the world is a great place, rather than the desperate unholy place we see in the news. 17. 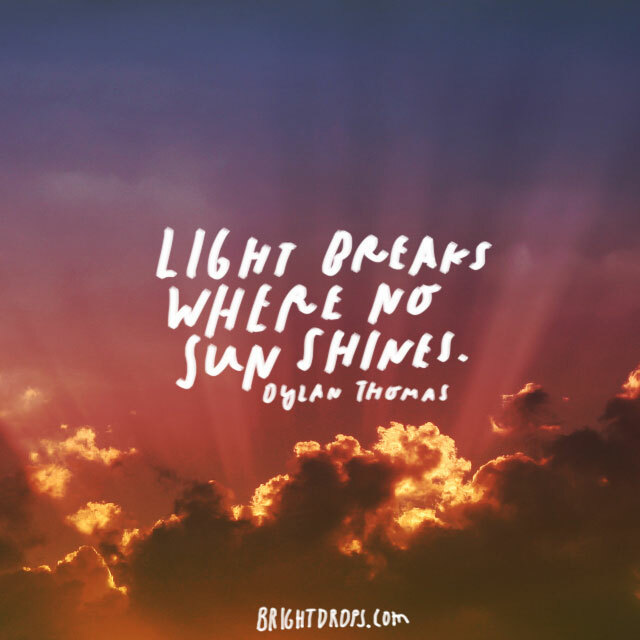 Dylan Thomas Sees the Light. When you have a person in your life that really is your sunshine, let them know with this famous Dylan Thomas poem. These words let them know that even on your gloomiest day, they shine a light that gives you hope for the future… and even the bleak present no matter how overwhelming it may be. 18. Marie Corelli Can’t Thank You Enough. When someone has gone above and beyond, let them know with this lovely quote from Marie Corelli. 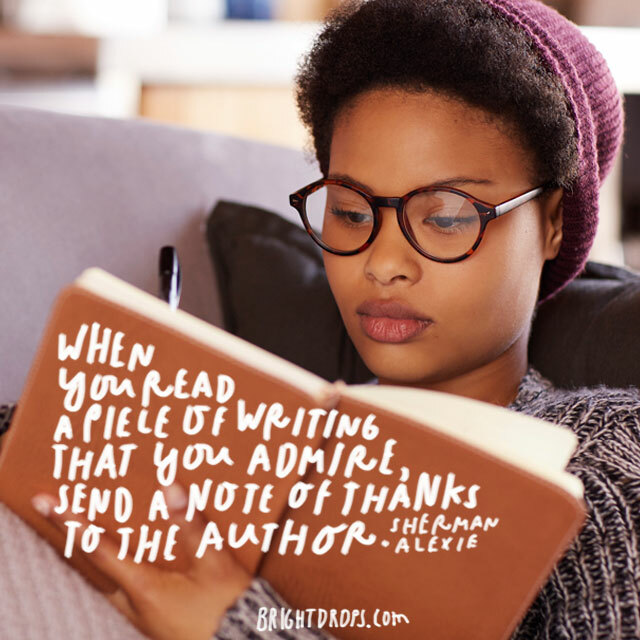 These words are a way of saying, “I can’t thank you enough,” but they include the reverence and beauty that you’re looking for without the sappiness of a poem or a cliche. Let someone know that they caught you at a great time. Things are going great for you right now and they have just added to a stack of blessings that can’t be measured accurately. Let them know that they were a part of the karmic forces in the universe balancing things out and finally allowing all the good to come back home to you, where it belongs. 20. 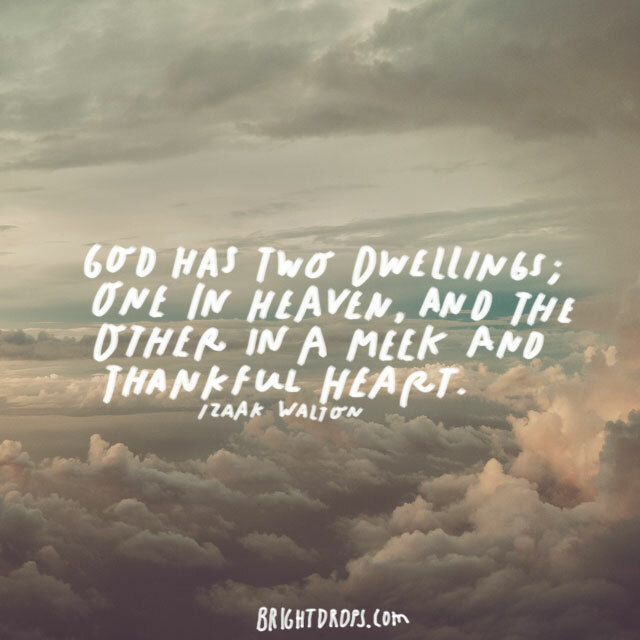 Izaak Walton Dwells with God. Indeed, god dwells on earth within us. We are the very representation on earth of god, regardless of your religion, creed, or particular denomination. Letting people know that you do indeed have a spiritual side can go a long way. 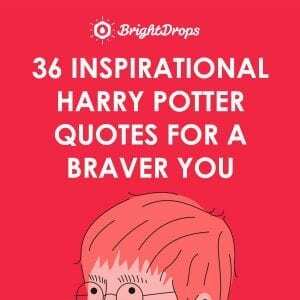 These quotes are especially great for those family members that won’t leave you alone about Sundays. 21. 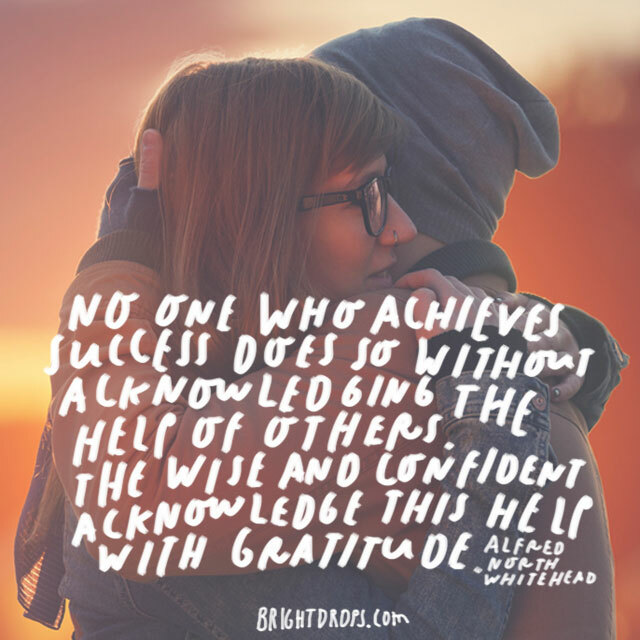 Alfred North Whitehead Acknowledges Others. Let people know that they have contributed to your success. No one accomplishes anything of great import without a support system in place. Whether that is thanks to your parents and upbringing or the friends that surround you, you must thank them for their contribution to your life. You ended up here thanks to their influence. 22. G. K. Chesterton Doesn’t Take Things for Granted. 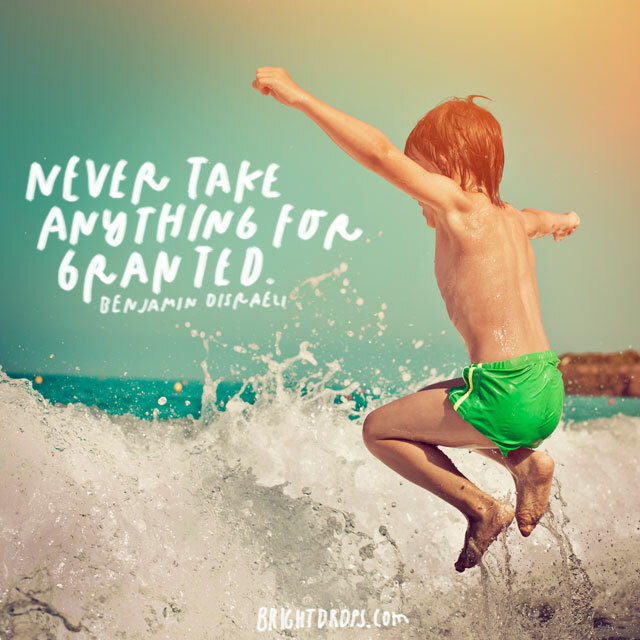 Don’t take anything for granted. Let people know that they are appreciated and that you want them to know just how grateful you are for their support. Without the guidance from others, you would just be like a ship adrift at sea. It’s the lighthouses that guide you and keep you safe. Acknowledge their importance as a source of light. 23. 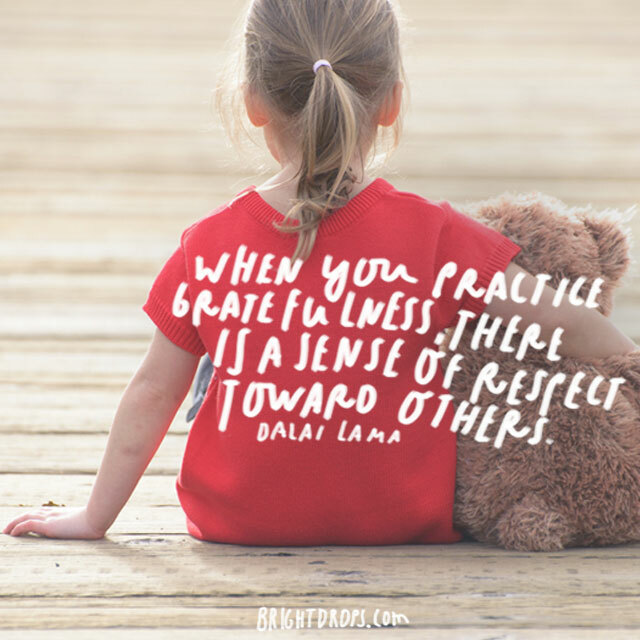 The Dalai Lama Practices Gratefulness. 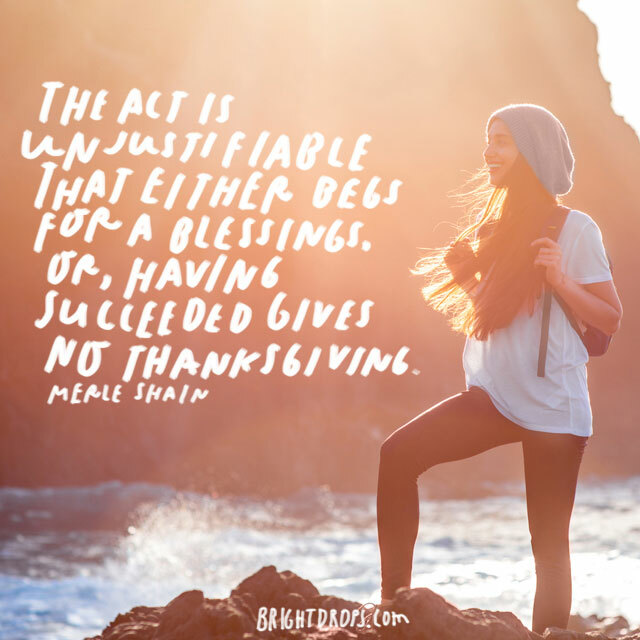 Giving thanks is a sign of respect. This is a great way to say thanks to those whom you respect greatly, especially if you have trouble telling them just how highly you hold them. We seem to have trouble putting into words the feelings we have for others. This quote from the Dalai Lama can help you say what you mean. 24. Jacques Maritain on the Most Exquisite Courtesy. Not only is gratitude a show of respect, it is also the best form of courtesy. Let others know that you have class and taste by offering a sincere and heartfelt appreciation for them. Being grateful verbally and in writing is a characteristic that is traced back to royalty in the first recorded instance. Before royalty began sending notes of thanks, we only saw thanks given to deities in history. 25. Boris Pasternak Is Immensely Grateful. This is a personal favorite. Instead of being able to express feelings with the precise words, Boris simply lays out all the emotions that overwhelm him in this moment of appreciation. Sometimes, letting people know that you can’t find the words is the best way to show that you are grateful. 26. Jackie Joyner-Kersee Gives 100%. Let people know that they are a part of your very best life, your very best efforts. They must know that you are grateful in all the small things, not just for the big blessings and successes that you’ve experienced. Seeing that you are humble in the face of little things let’s them know that you have a good heart. 27. John Milton Bestows Reverence. Some people are uncomfortable being thanked. Let them know that accepting your gratitude helps you grow and experience the world in a better way. The examined life is one that is better lived and more fulfilling. By involving them in your growth and life’s journey, they will be more open to the idea of gratitude and learn to accept it with grace. 28. Saint Basil Is More Grateful Than a Dog. 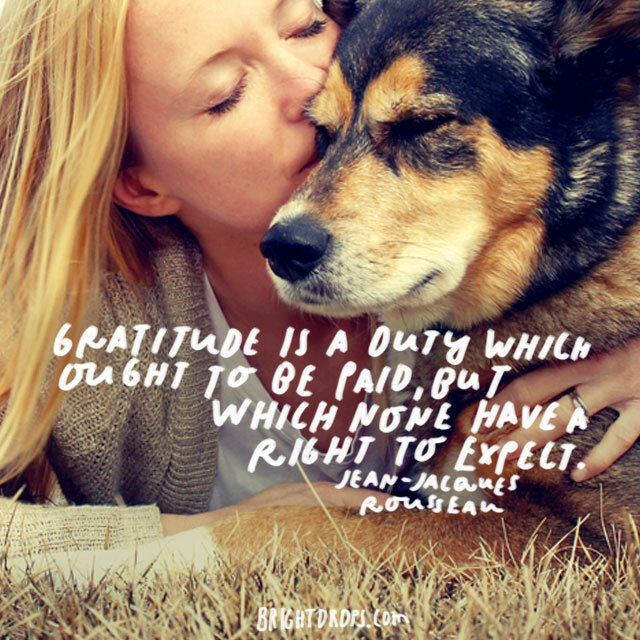 Even our dogs show us they are grateful. 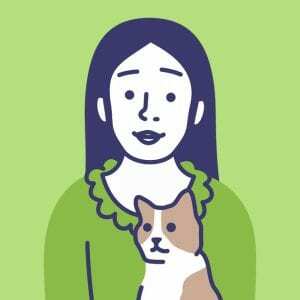 When you fill a bowl, pet their head, or show them a little extra affection, they seem to smile and let us know they love us. How shameful is it that some people aren’t that thankful. This is a great quote for the pet lover, or better yet, the pet hater. 29. Willie Nelson Counts His Blessings. When you take a moment to look at your life, you start to realize that there are far more things to be thankful for than things that are really awful. 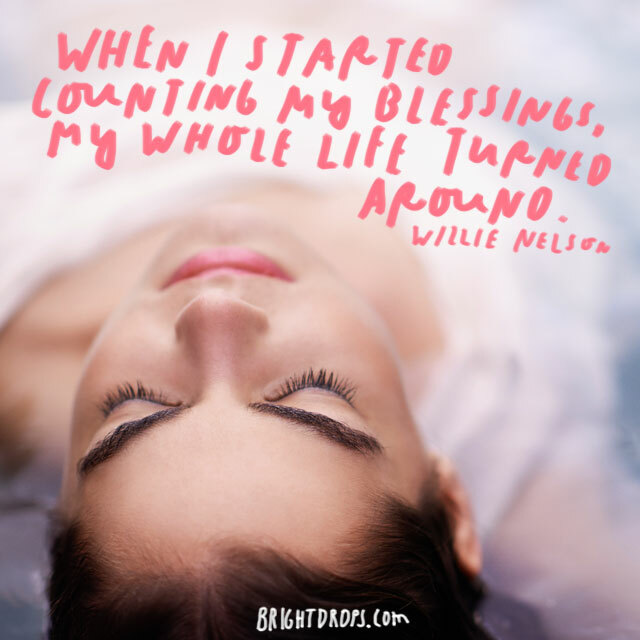 This quote will allow people to know that you count them among the many blessings in your life. 30. Joyce Meyer Is a Happy Person. 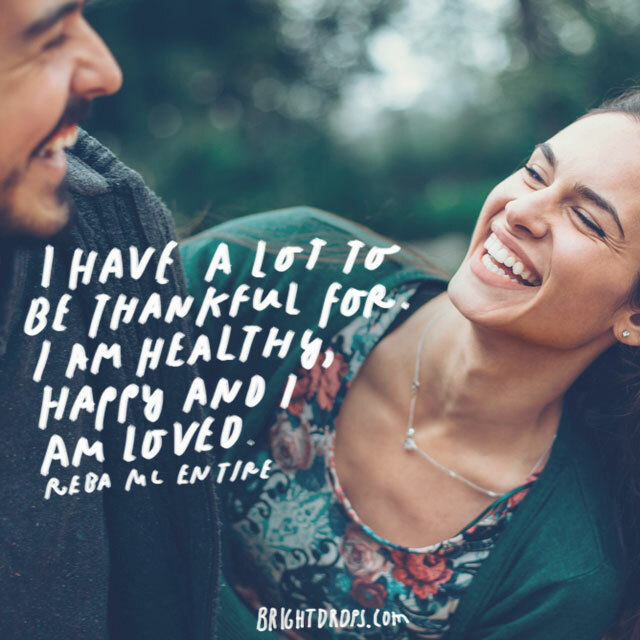 This wonderful quote let’s the person know that you are grateful but also let’s them know that you are happy. You’re happy with life, not just what they have contributed to your well-being. Letting people be a part of your personal success is good karma and it let’s you be a part of their success as well. 31. 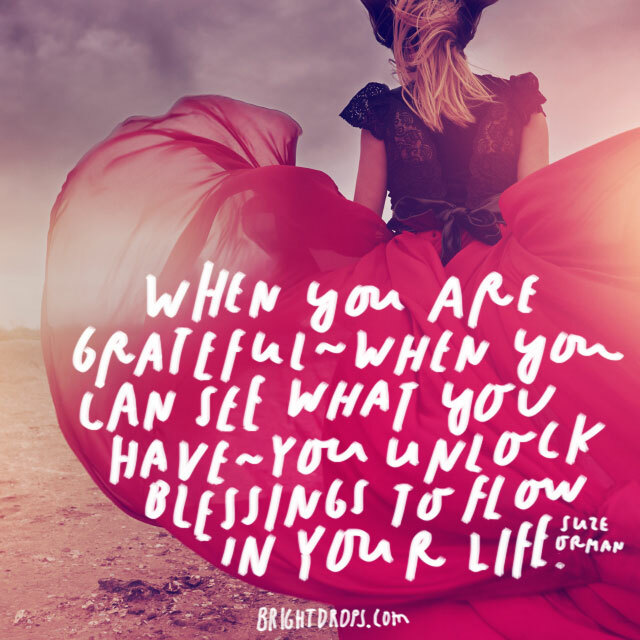 Suze Orman Unlocks Blessings. 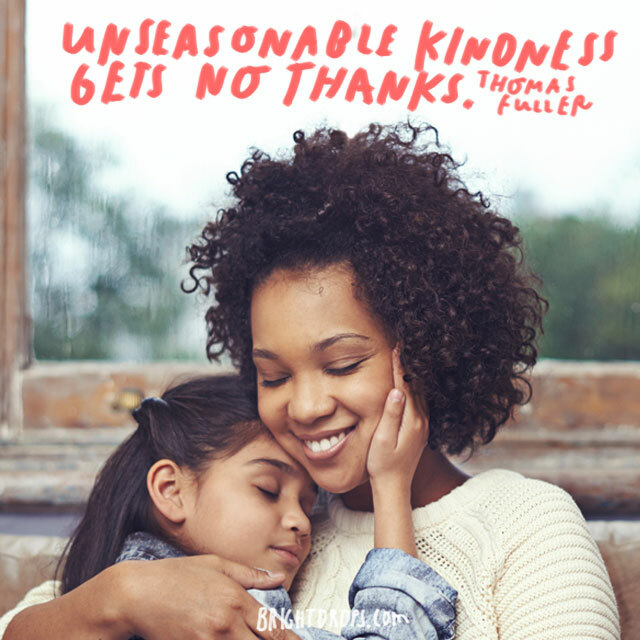 This one seems a little selfish because you are in a sense saying thanks in order to get even more blessings in your life. However, this is actually a lesson for the recipient. You can give them this mentality so that they can pay it forward themselves. Again, this is a way to incoporate people into your successes and vice versa. 32. 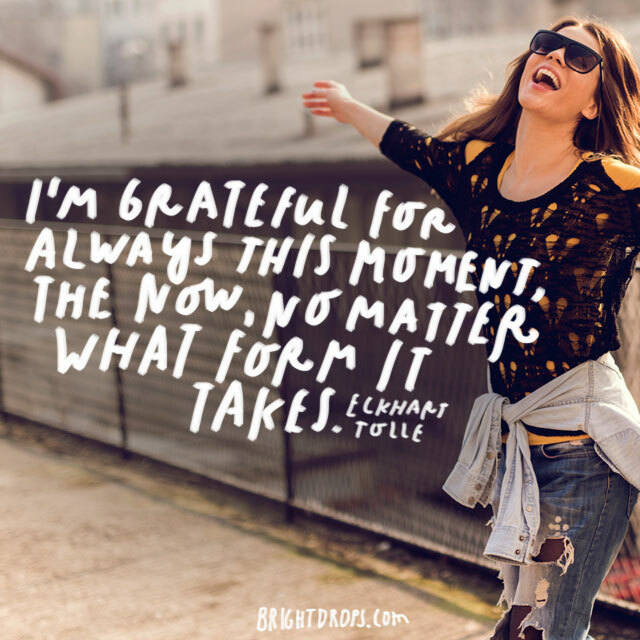 Eckhart Tolle Is Grateful Every Moment. Sometimes when we are looking for the right words to say to someone, there are no words that can express exactly what we are feeling. With those people who are always there for you to listen, laugh, and even cry with you, what better way to express your gratitude than this wonderful quote from the master of now himself? 33. Henry Ward Beecher Is Not Proud. This is a great setup for explaining that you do not take anything for granted, especially whatever it is they might’ve done for you in your life. You can’t possibly deserve to be surrounded by such wonderful and loving people. Let them know that you are consciously aware of just how wonderful they are, separate from any tangible stuff they might provide you. 34. Dietrich Bonhoeffer on a Tranquil Joy. Nothing can really deliver the emotional depth like a quote from Dietrich Bonhoeffer. He lived as spy for the allies, though he was only a religious philosopher, during the Third Reich. His dedication to doing what was right put his own life at risk in order to protect others and ultimately played a role in several Nazi defeats. 35. Maya Angelou Works Hard, Plays Hard. Sometimes the moment slips by and people feel like maybe you didn’t appreciate them as much as you should’ve. Yeah, you know who we’re talking about. 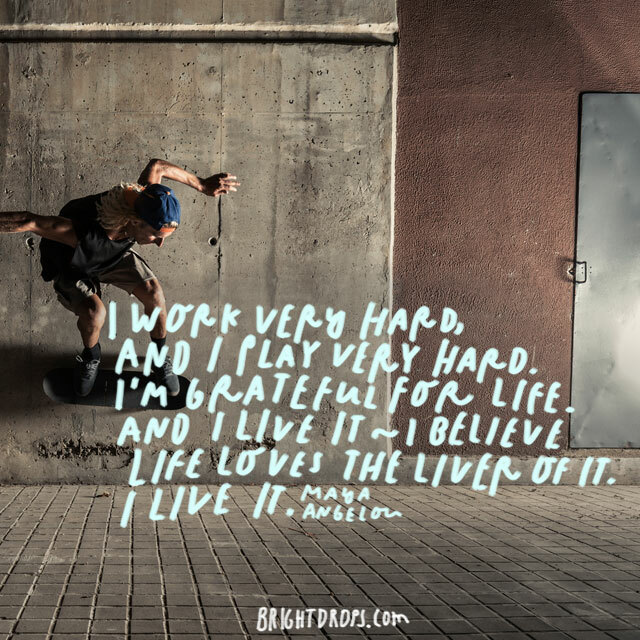 This quote can let them know that you love life so much that every once in awhile it seems to outsiders that you overlook some of the things they’ve done for you. Cover that up with this brilliant Maya Angelou quote. 36. Antoine de Saint-Exupery Ain’t No Prince. This is a very deep and sincere way to thank someone for being so kind as to think of you with a gift of monetary value. It’s also a way to show them that you understand they aren’t offering a gift just to be recognized. This is especially useful for any charity work you may be involved with as a way to say thank you to your supporters. 37. Tony Snow on National Treasures. Everything that comes to us in return is just a gift we receive with the universe’s understanding that we will be grateful. When you start feeling arrogant or entitled, suddenly blessings stop flowing. 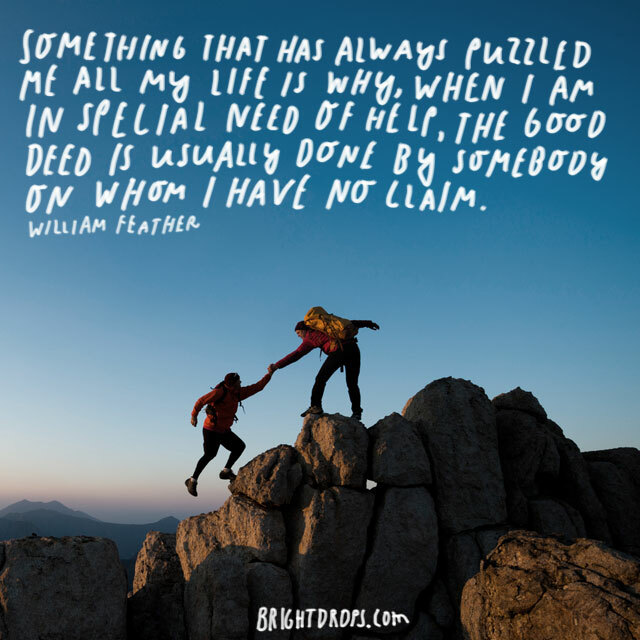 Use this quote to help pay it forward a bit. People will begin to understand that having a gracious heart is essential to life. 38. Daniel Defoe on Discontents. Let someone know that they have really cheered you up. You might’ve had a bad day. Or week. Or month. Then they came along and shined a light of hope in your life and suddenly you were able to see that life was worth living and not everything is quite as bad as you thought. They helped you see all the good things you have and maybe you stopped being a self-absorbed brat. Don’t be embarrassed; it happens to the best of us. 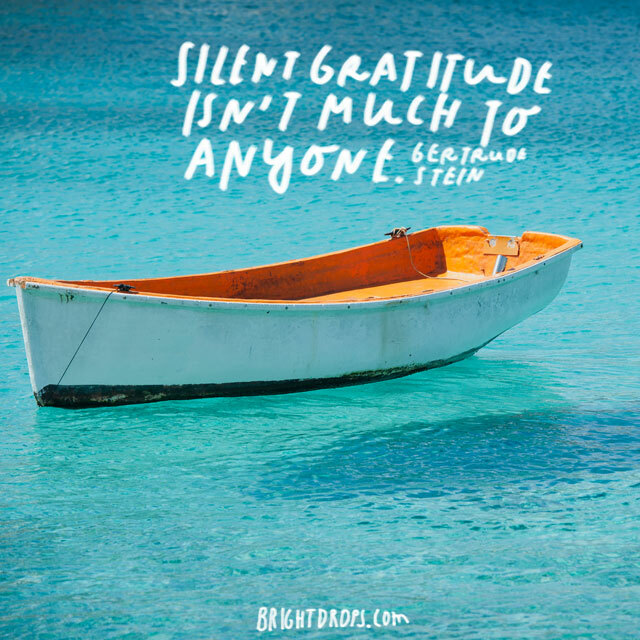 Another way to say thanks is to let someone know that you are only being so grateful because it is a part of your nature. This is an especially good quote for those friends that haven’t quite managed to grow up enough to thank you. Like your pal Eric who doesn’t know that Thank You cards are printed, much less a thing that grown ups are supposed to send out. 40. Thomas Fuller on Kindness. Let someone know that you’ve noticed everything they do, even though it’s not Christmas, your wedding, or your birthday. This is a great quote for those friends that have been there for you through thick and thin in big things and little things. They have never asked for a thing and they are there no matter what. 41. Channing Tatum Like Weird People. This is a great way to thank those weird folks in your life like your best friend that you can laugh with about things that no one else would even smile about. Say thanks for going to see 22 Jump Street or whatever silly thing you do together because neither of you could ever find another fool to go along with the ridiculous adventures you enjoy. 42. 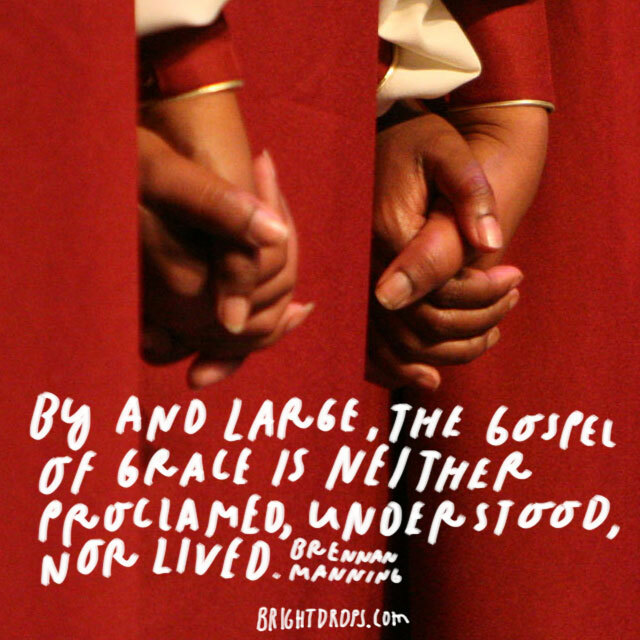 Brennan Manning on the Gospel of Grace. By allowing you to be grateful, this person is helping revolutionize the world. We don’t have an attitude of graciousness. Be part of the revolution and change the way we prioritize the actions of others by using this quote to recognize those important people in you every day life. 43. Sherman Alexie Thanks Authors. This is a great start for the email you’ve been waiting to send. You’ve logged on to see your favorite author’s blog, but you’ve never clicked the email link. Go ahead and send them a little note of thanks. You’ll never know how much they’d appreciate it. If you include this quote, you’re sure to get a response. Sherman Alexie is a writer’s writer. 44. Deborah Norville Is an Innovative Thinker. This is a way to let people know that they need to make some adjustments as well. It’s a way to say thank you, but to let them have a chance to learn. 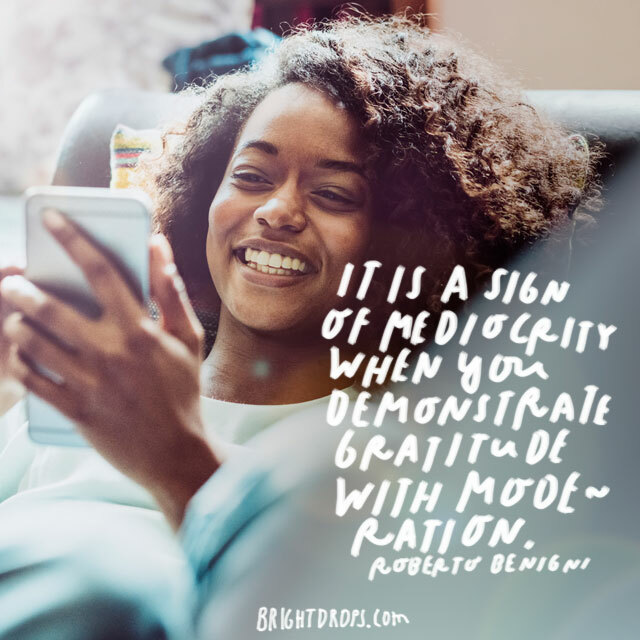 You can always make it a bit of a joke and say that you are only thanking them for purely selfish reasons, hoping that you will become more innovative yourself. However, this is actually a hidden lesson for those folks that need a little positive guidance. 45. 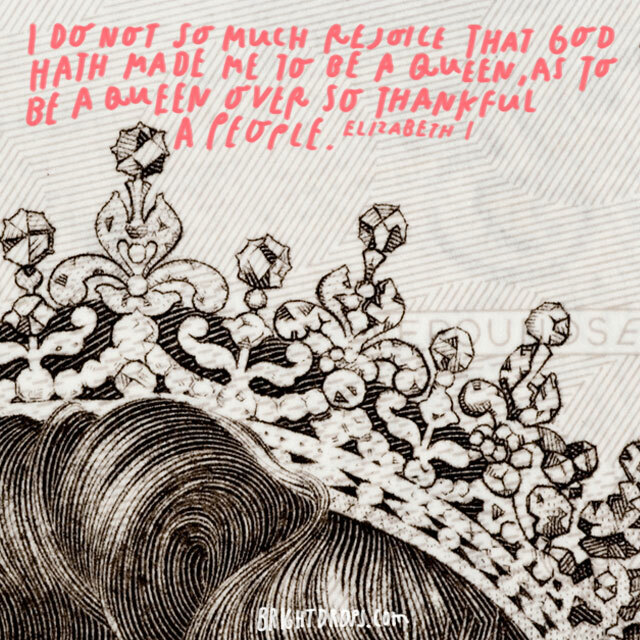 Queen Elizabeth I Rejoiced for Her People. Everyone has that special someone in their life that simply won’t let them escape the title of “prince” or “princess.” This quote is the perfect way to say thank you in a cheeky but fun way. Thank them for being a lowly peasant in your kingdom. It’s a way to say thank you for the little things that they do in your life. 46. Rod Stewart Gives Thanks Daily. 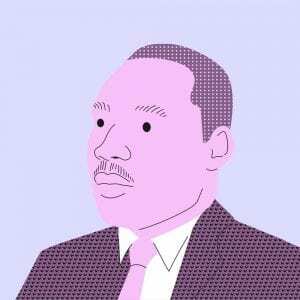 This one can be used in funny or sincere ways. You can include this and then tell someone that you figured if Rod Stewart could thank someone every day surely you could send a thank you card for all the things that people do for you. You could also use this as an example of how they make you feel like a rock star. 47. James Brown Loves Everyone. Let people know that you’re turning over a new leaf. You are starting to recognize all the great people that surround you every day. This is a great quote to reference both Christ and James Brown. It’s a doubly whammy of goodness. 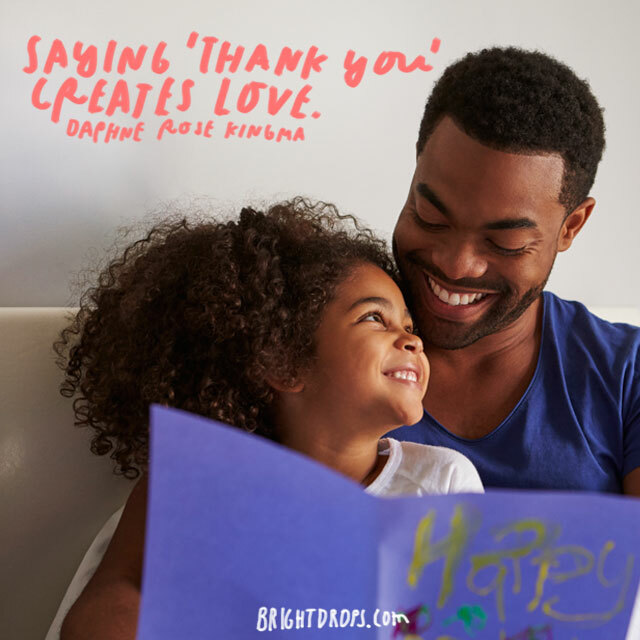 This can help you get into the habit of saying thanks on a daily basis. Use this quote for someone who is always there for you, but doesn’t do enough for them. Remind them that they should do something nice for themselves. Include a small gift of some sort to help them get going whether it’s a few bucks or a small gift card. They need to take more time and you are the one to help them start that habit. 49. 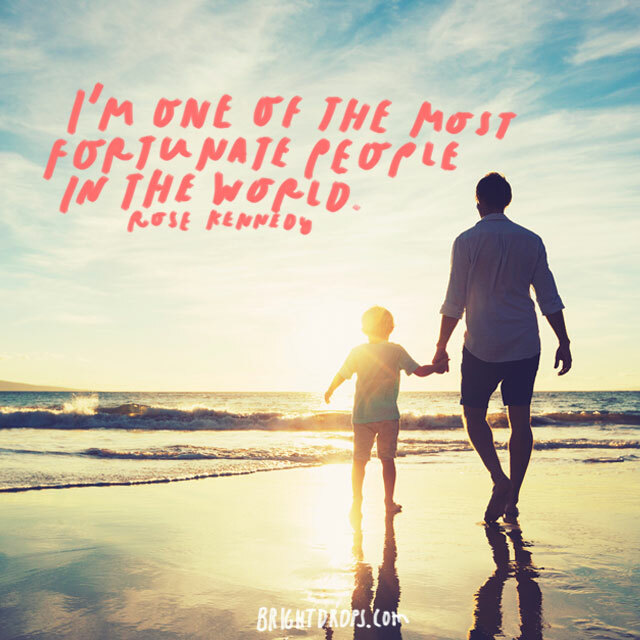 Rose Kennedy Is Fortunate. For those wonderful people that truly make your life amazing, you can include this simple quote. It’s not so much the content of the quote, but the source. Let them know that their very presence in your life makes you feel like American royalty. They give you the feeling like you are walking on sunshine all the time. 50. 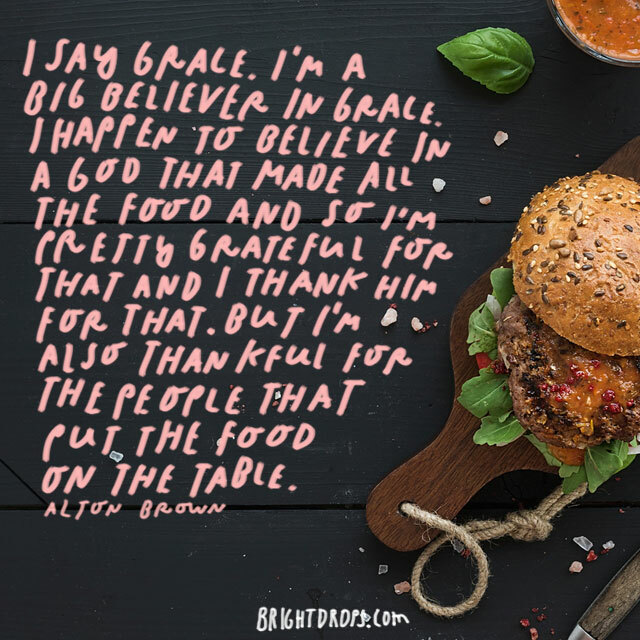 Alton Brown Says Grace. This is a great way to thank people who have provided for you whether it was in a time of need or just in your life as you came of age. They never do realize how much they’ve done for you. 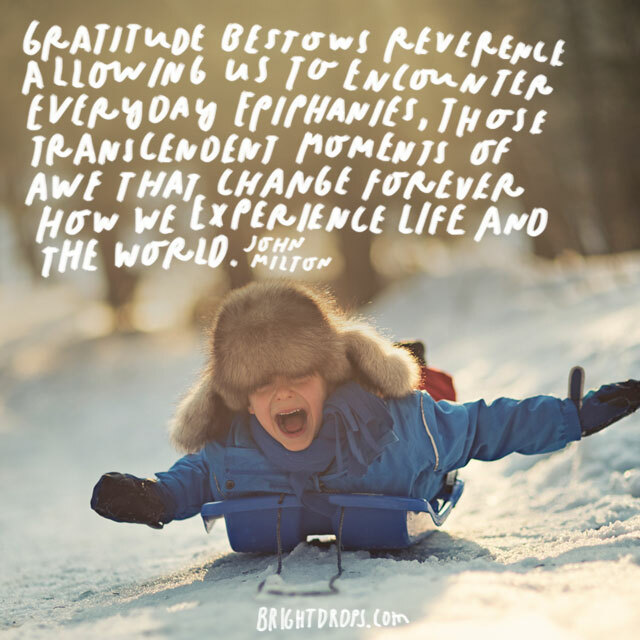 Use this quote to put just a piece of that gratitude into words. They deserve more than words, but this can help bridge the canyon of debt you have to them. 51. Merle Shain Always Says Thanks. Let those around you know that you are not begging for another blessing, nor are you ignoring that you should be grateful. This is a great way to let people know that they are important and their actions have made a meaningful impact on your life. You can also let them know that you are a genuinely humble person. 52. 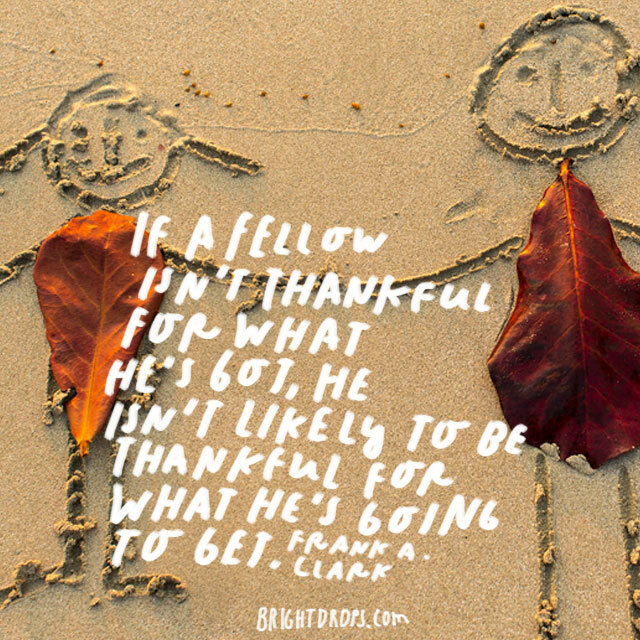 Frank A. Clark Is Thankful for What He’s Got. This is a great light-hearted way to say thank you. You are letting them know that you appreicate everything they have already done for you. This is especially appropriate for those people that are regularly going out of their way to do things for you. You are acknowledging what they’ve done, but also letting them know that they are a continual blessing in your life. 53. Pharrell Is Very Thankful. There are those of us who say thank you all the time. Let someone know that even though you are grateful all the time, it’s just part of who you are. Hopefully, they will learn this habit from you and begin to give thanks to others. 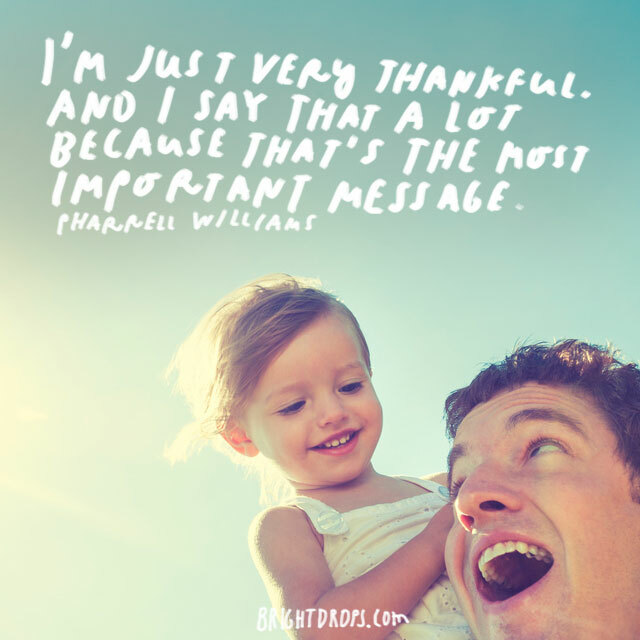 This is also a great way to justify the amount of thanks you give, especially to those people that are just awesome. 54. Franz Grillparzer Thanks the Host. Here we have a great quote for a party. When someone invites you to a party there is an awkward bit of energy between you. You have to find a way to thank them. 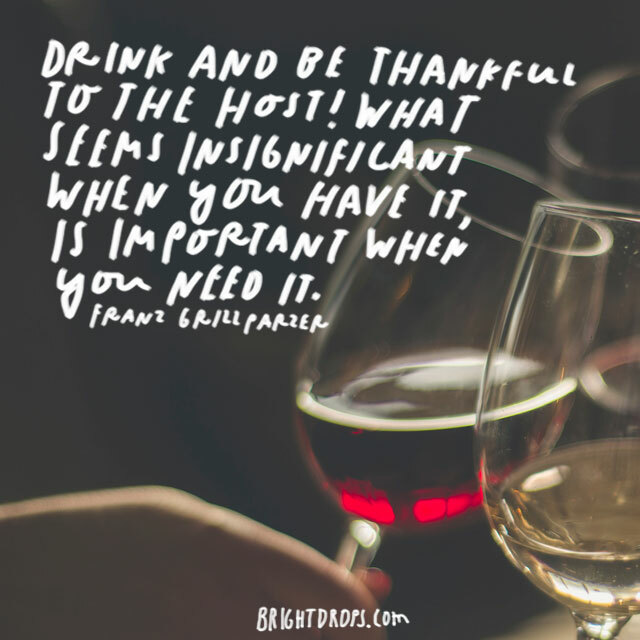 This quote says it all and let’s them know that their hospitality is not overlooked. Being a gracious guest eliminates the obligation of returning the hosting responsibility, too. That’s just a bonus. 55. Reba McEntire Is Healthy, Happy, and Loved. For those in your inner circle, they see your day to day life. They already know that you have everything you need and you want for very little. Let them know that they are one of the people you can count on and that you count them among your most trusted friends. You are blessed. 56. Al Green Loves Every Minute of It. There are times when we have an overwhelming need to say thank you to those people who seem to naturally fit into our lives. In the big puzzle of life, they are a puzzle piece that drifted throughout space and time until they locked perfectly into place to make a beautiful picture with you. Let them know they aren’t taken for granted. 57. W. Clement Stone Shares. Everyone has an inner circle of people they can count on. Some people call it their ride or die, their lifeboat, their BFFs, or a million other names. The truth is that you probably feel so in touch with them that you can sense when they are having a rough day. They do the same for you. This is another quote to let someone know that they are a VIP in your life. 58. William Blake Bears a Plentiful Harvest. When you are thankful, more things come your way. You cannot begin to count your blessings and be grateful, because by the time you get to the end of that list, there are 25 more things you have to add. The list continues to go on and on forever. 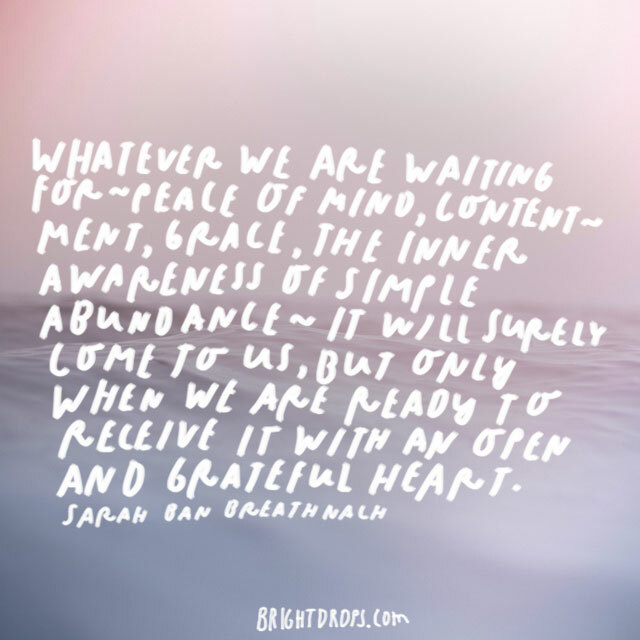 It’s an infinite cycle of receiving and giving thanks. 59. Bindi Irwin’s Heart Is Touched. There are those people in your life that have been influential, but you’re not exactly sure what kind of title to give that relationship. If you have a sincere heart, the right words don’t always matter that much. Let them know that you are grateful for the little things. Even if it’s just how to use the bottom of a cupcake to make a cupcake sandwich so you don’t get icing on your face. 60. Thomas Secker Enjoys Much. When you make a habit of being gracious, you’ll begin to send emails or quick notes to people that do very small things for you. This is a great quote to justify your newfound joy in life. When you are grateful for little things in life, the big things just seem to work out. Be thankful for those little things, so the big things are part of your natural state. 61. Charles Spurgeon Is in the Right State of Mind. Sometimes it’s hard to find the time to put together a nice note, card, or email. 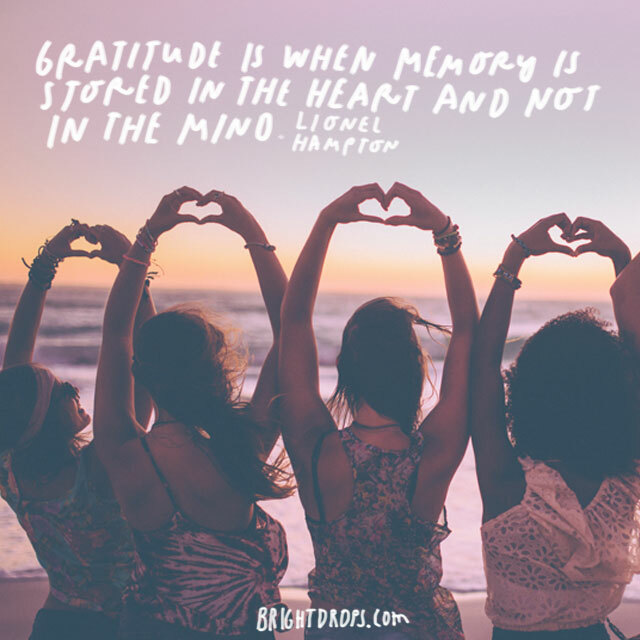 The fact that you actually sit down to figure it out and get those notes of gratitude delivered means that you are in the right state of mind. Take the time to let people know you appreciate everything they’ve done for you, and they will see the light that shines inside you. Billy Shakespeare couldn’t even find the right words. If the greatest playwright in history can’t seem to find an elaborate and elegant way to be a gracious person, how could any of us ever hope to find the perfect word combination that will unlock the mysteries of life? We can’t. Just say thanks. That’s all people want. 63. 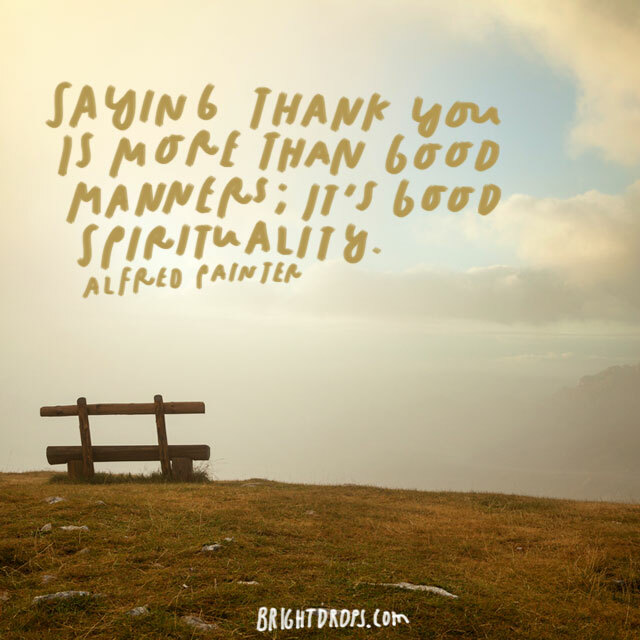 Alfred Painter Has Good Manners. Practicing an attitude of grace and thanksgiving is a part of most religions. The reality is that those are spiritual abilities more than they are obligations for cotillion lessons. 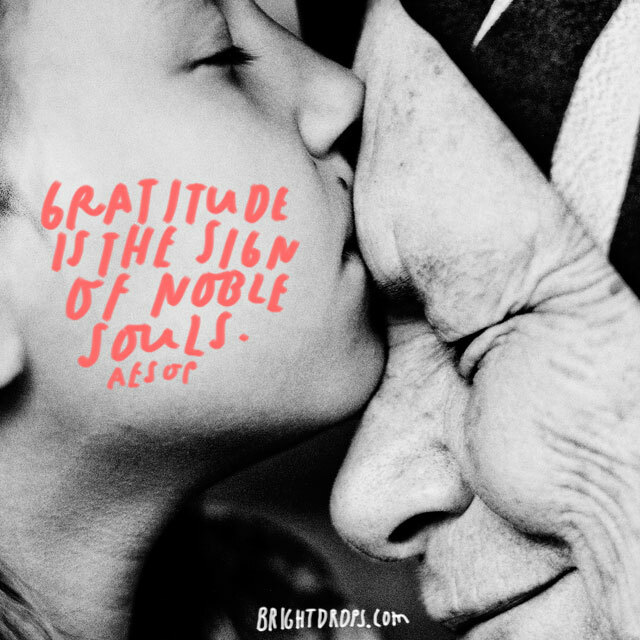 Being grateful shows the very nature of your soul and reveals the intentions of your heart. Let people see the inner beauty that makes you who you are. 64. A Hansa Proverb of Thanks. 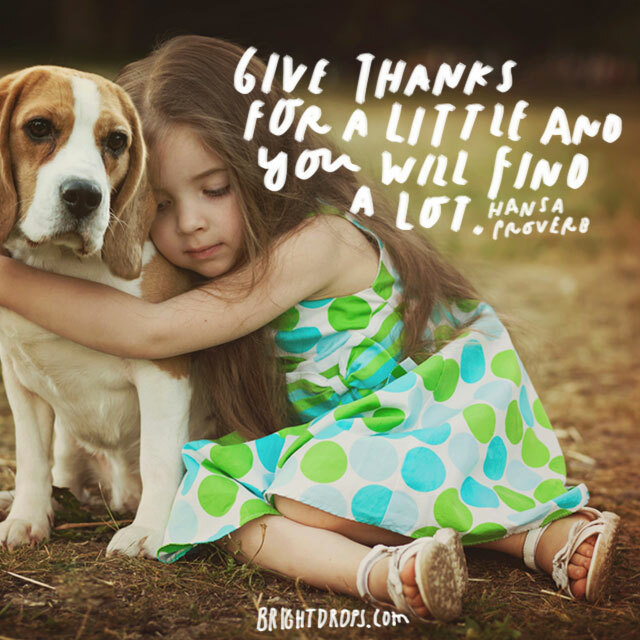 This proverb sums up the great treasure of being grateful. When you do take the time out of your day to extend thanks to those who have helped, you unlock more blessings that will flow into your life. Use this quote as part of your email signature and people will be able to use this in their own personal life as well. 65. John E. Southard Helps Those Who Helped Him. Don’t carry grudges. When you owe someone, you should owe them because they helped you out. 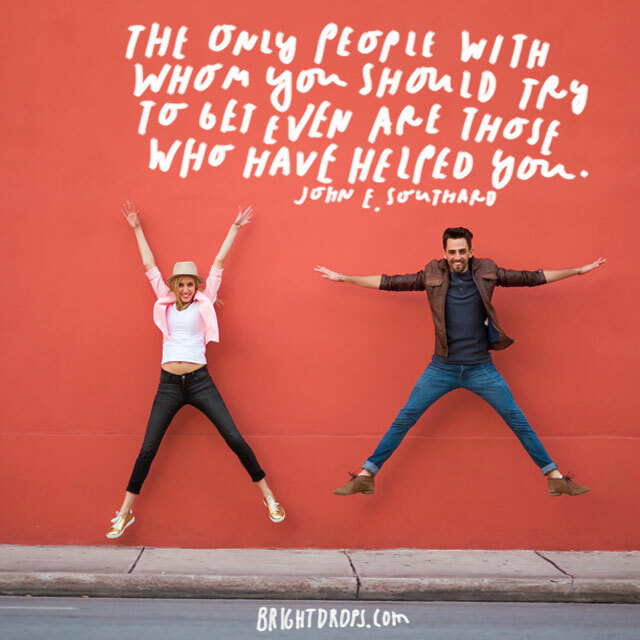 Especially if that person gave you a helping hand when you were in a rough spot. When it comes time, you have to help them move out of their apartment even if it’s on the top floor. At least they only have one couch. 66. 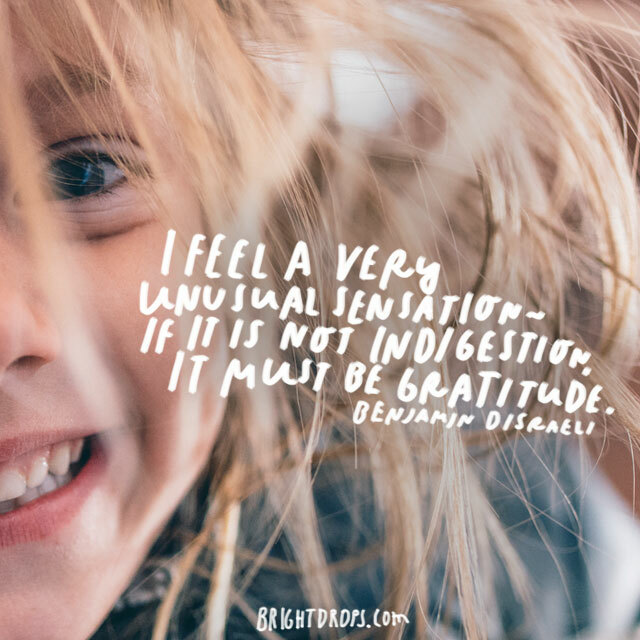 Benjamin Disraeli Feels Unusual. Sometimes you feel the need to thank someone. What is worse is when you have already departed their presence and you completely overlooked their actions. This is a great way to say “mea culpa” and let them know that you did indeed notice, but the moment escaped you. Most people aren’t keeping score and will just be happy to hear from you. 67. 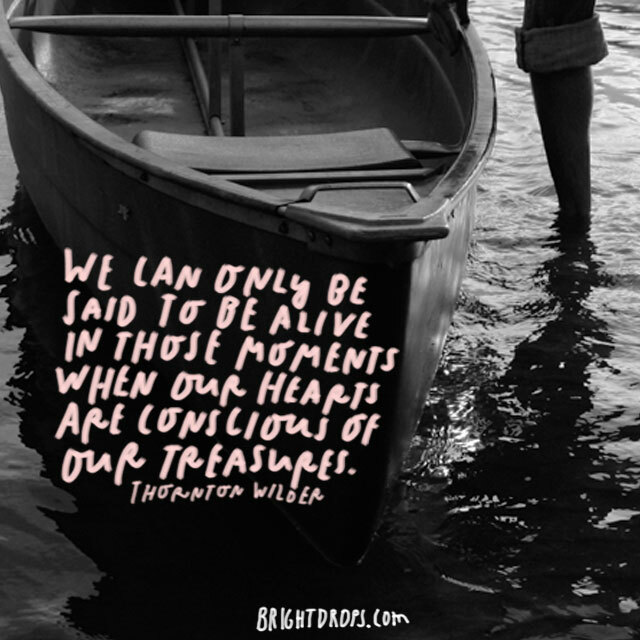 Thornton Wilder Is Alive! The truth is that we all feel a bit more joyful and a bit more alive when we acknowledge all the great people and possessions in our lives. We have food and shelter and we are loved. 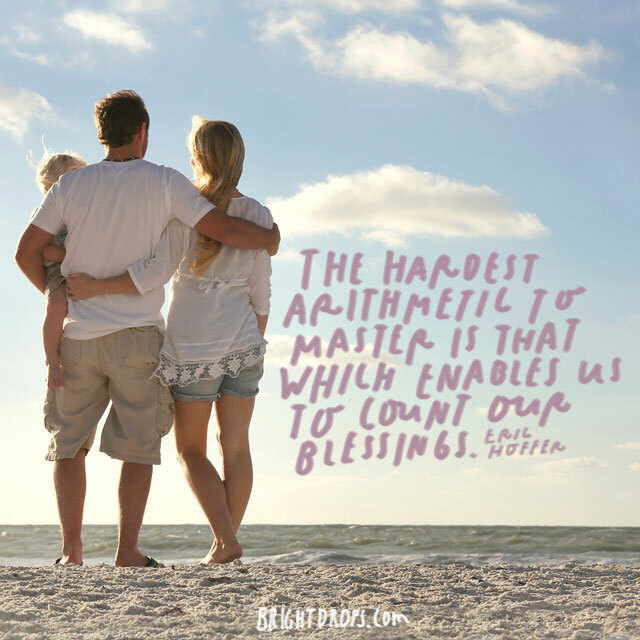 When you count the individual blessings in your life, you can’t help but be overwhelmed with every emotion. 68. 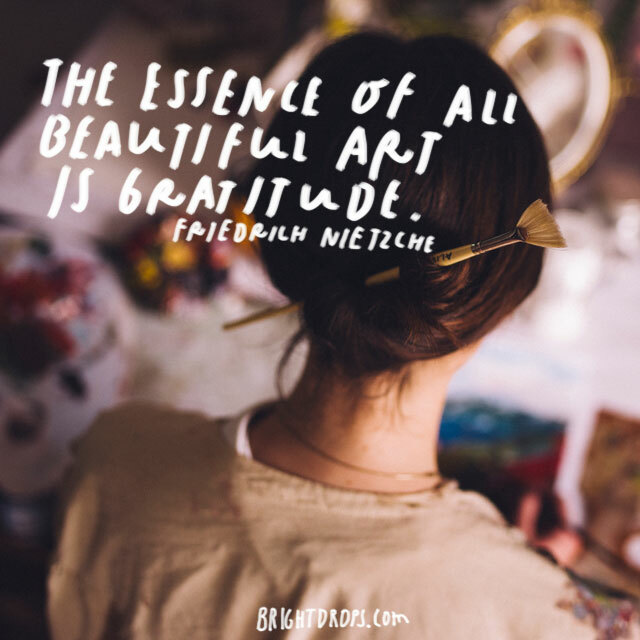 Nietzsche on Beautiful Art. 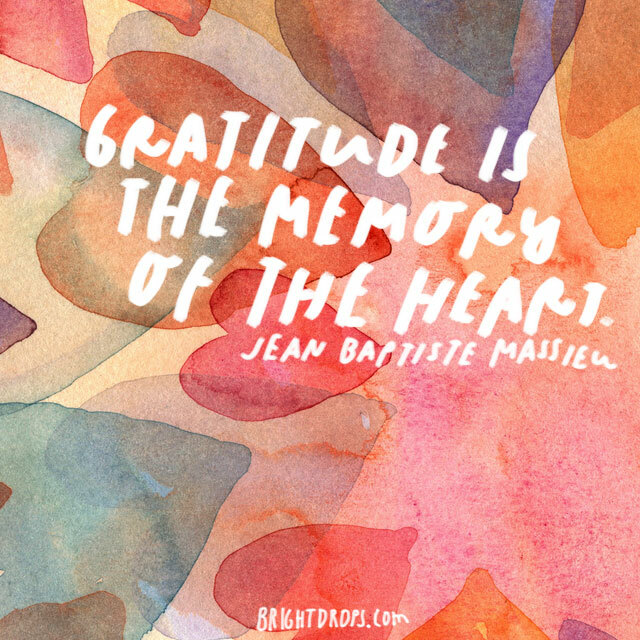 Even the world’s most famous skeptic understood the importance and beauty of gratitude. The best and most wonderful things on the earth are all just a form of gratitude. Unfortunately, most of us are not Vincent Van Gogh. So, when someone does something for us, we have to use a quote or a thank you card instead of our brush strokes. 69. JFK Has the Highest Appreciation. When you say thanks, you are telling someone that they mean so much to you. You can’t just say or write those words and think that your debt is paid. Instead, you have to live in a way that let’s that other person feel validated. You must be grateful in your actions even more than with your words. 70. 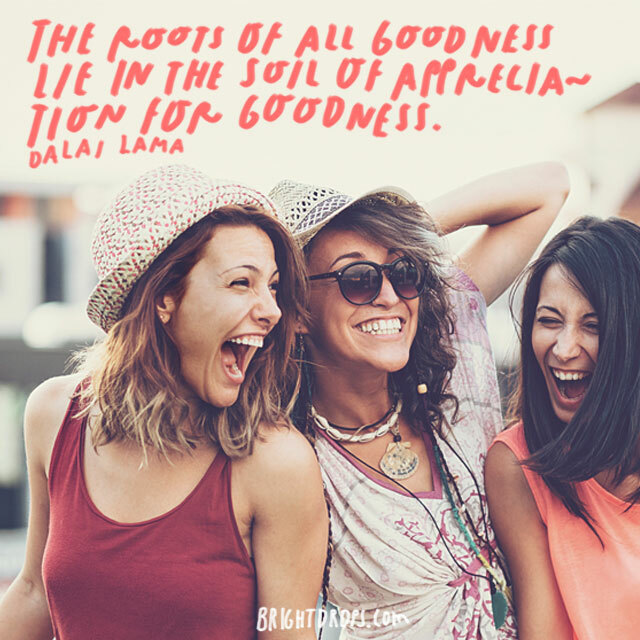 The Dalai Lama Has Deep Roots. Some of the people you want to thank are just good people. They may not even give gifts or host parties or bless your life in a way that can be defined monetarily. That’s even better. They are a part of your foundation in life. They are those good people that surround you and ground you and make you who you are. 71. Roberto Benigni Is Not Mediocre. Never be afraid to say thank you. Beyond that, be sure to show thanks even when others might not. Say it with your words, send an email, and go out of your way to bring it up again. 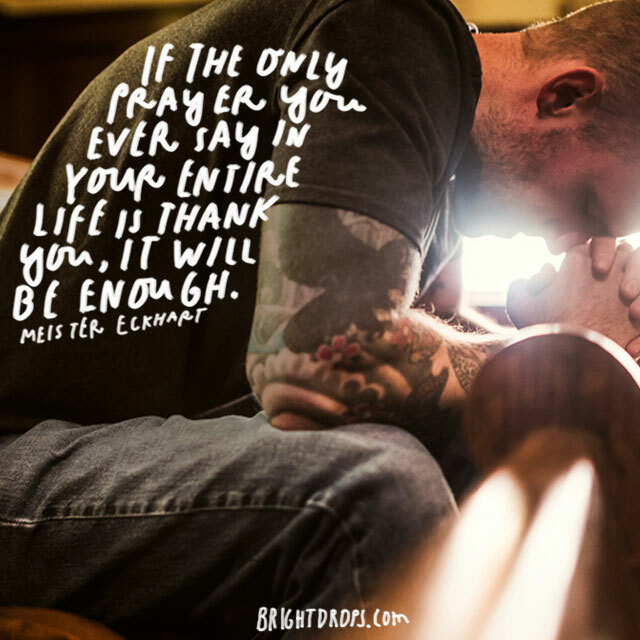 There’s no amount of gratitude that is too much. Think of it as syrup on your pancakes (especially when you were a child). 72. Loretta Young Isn’t Burdened. 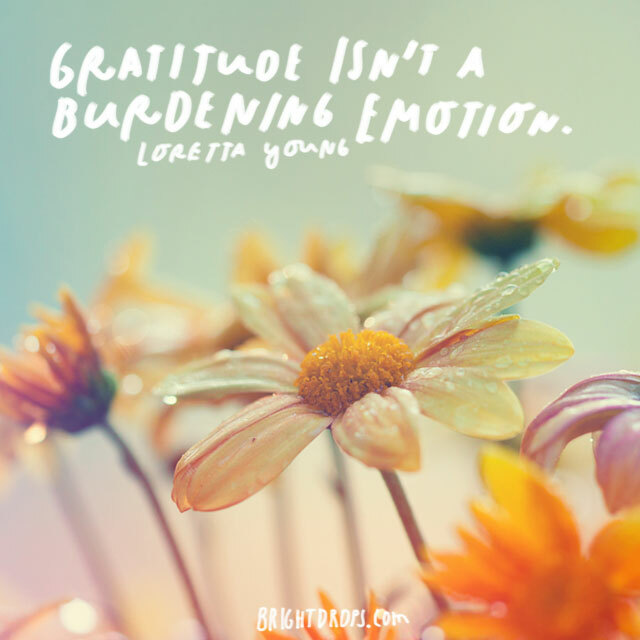 When people start to tell you that you say thanks too much, Loretta Young’s quote can really explain it. You aren’t burdened by the amount of thanks you give. Instead, it is an outpouring of your emotion for all the blessings you feel in your life. Never be afraid of being too grateful. That’s some sort of paradox. 73. Emerson Cultivates the Habit. This is another quote that can become a part of your life. You could use this in thank you notes but you can also use this as a quote to incorporate into your daily life. Put it in your cubicle, on your dashboard, or someone else you’ll see it every day. 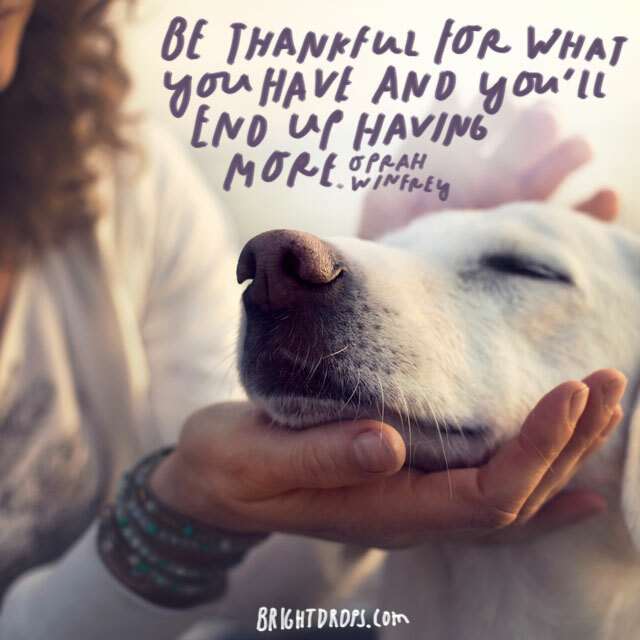 This will help you become more conscious of all the things you have to be grateful for. 74. 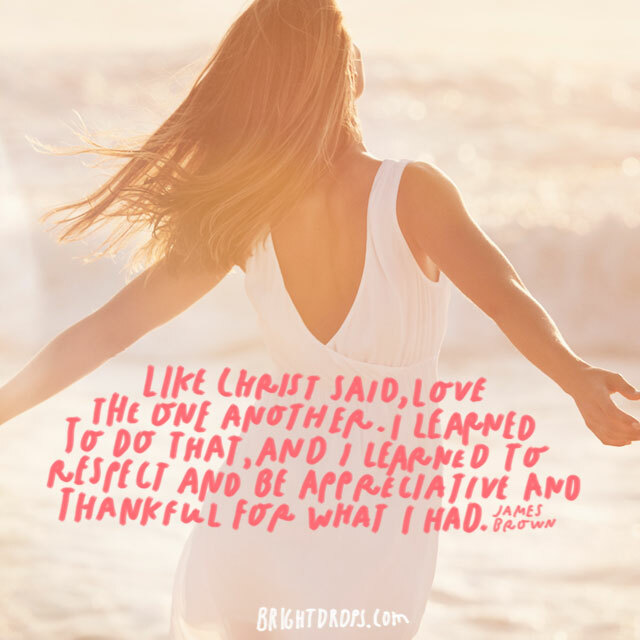 The Apostle Paul Is Thankful for Everything. Be grateful for every meal, every car ride, every walk, every blessing, and every setback. Sometimes we overlook things we think are negative because we don’t see how setbacks help us grow in the long run. Find a way to give thanks for every moment of your day and it will be no problem to give thanks to those who give to you. 75. 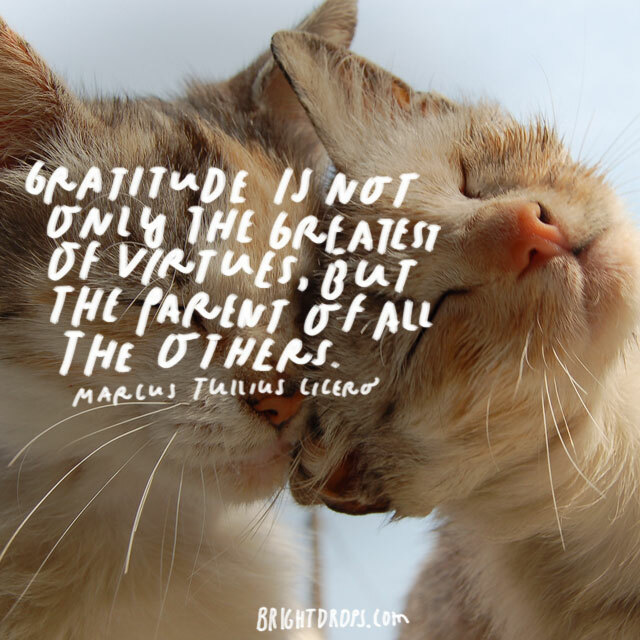 Marcel Proust Is Grateful for Others. When others make us happy, we should be so thankful for their presence and influence in our lives. It is easy to get lost in the to do list of today. We must learn to shift our focus; become more simple. See things for their value in your life on a moment by moment, day by day basis. 76. 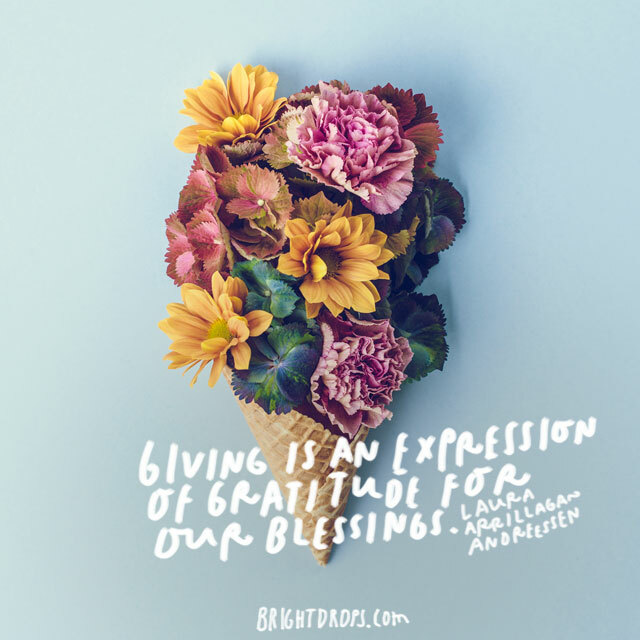 Laura Arrillaga-Andreessen Expresses Gratitude. There are times in life where we give gifts as a way of giving thanks. This quote can go on that card to fill that blank space. Sometimes, we don’t know what to say. Don’t feel awkward. Giving is a normal sign of gratitude. When someone is a blessing to you, it’s only natural to be a blessing in their own life. 77. 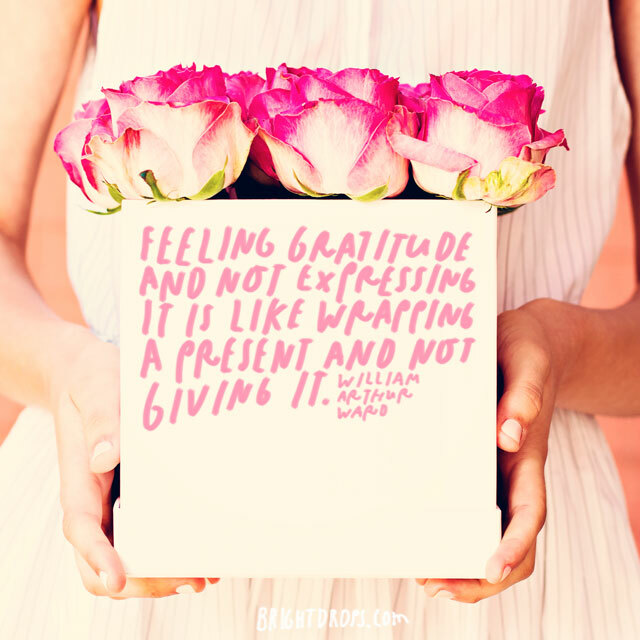 William James Craves Appreciation. We all need to be appreciated. 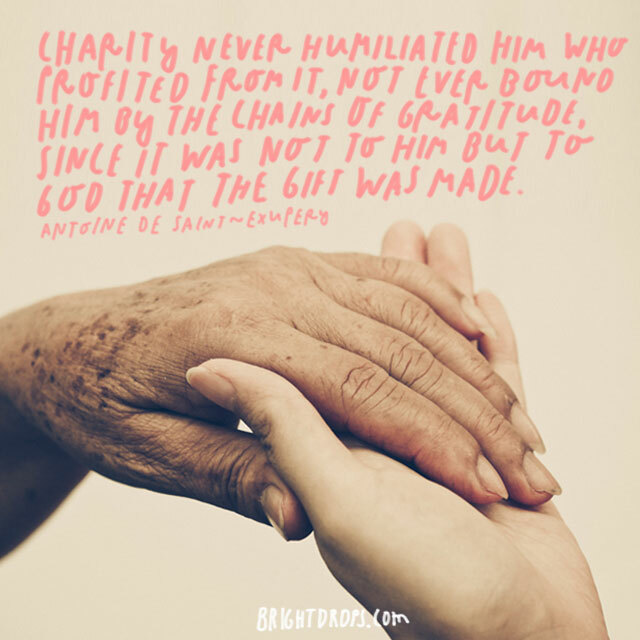 When people are apprehensive about being thanked, hit them with this quote and they’ll know that you are simply trying to fulfill their basic human needs. It’s hard to argue with doing the bare minimum. 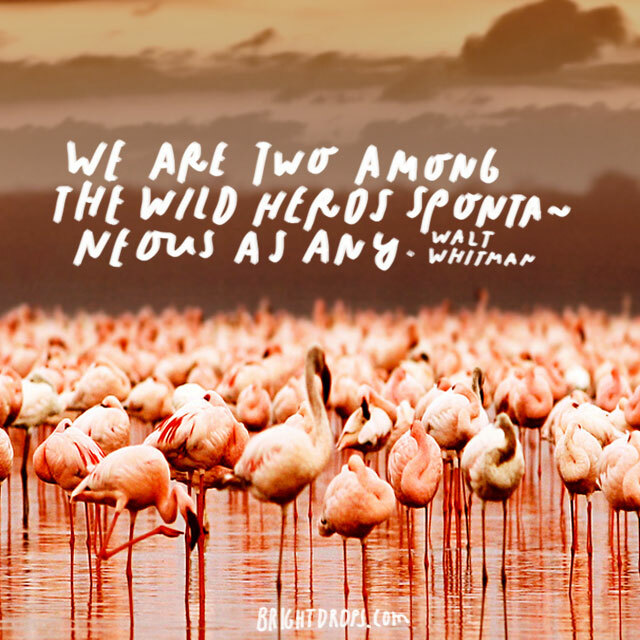 William James is right anyway; we do need to be appreciated. 78. Oprah Has More Than All of Us. If this quote came from someone else, it might not hold the same weight. However, Oprah has been quite successful. She has always been grateful. There is no doubt that she has worked very hard and has had some breaks along the way. She never credits her success to that. Instead, she talks about positive energy and a good heart. 79. Gertrude Stein Is Loud. When you feel appreciation, express it. It does no good to keep those feelings locked away inside. You must be grateful and verbalize those feelings of appreciation. When you feel that someone has been a real blessing in your life, there’s no way to hide it away. Let those thoughts come into the light. 80. Henri Frederic Amiel Begins with Thanks. The actions that show your gratitude are the key to expressing your feelings. You can say thank you and write a note, but showing that person that they mean the world to you is the most important. 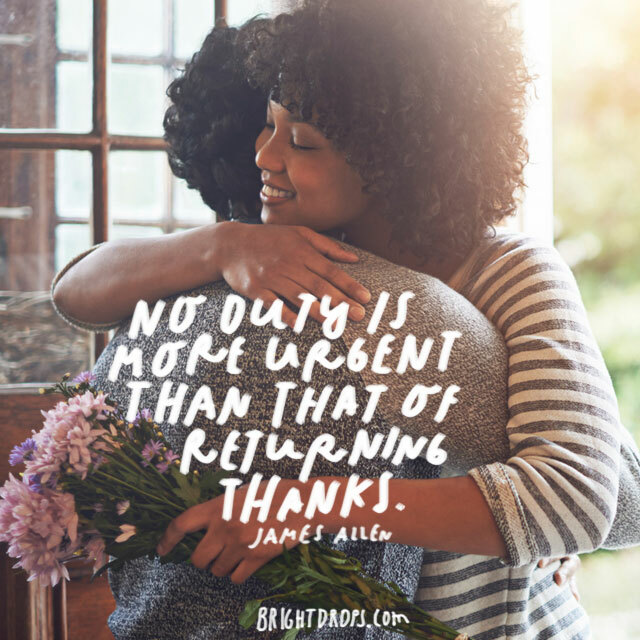 Saying thanks takes only a few minutes. Being grateful is something that is shown in your actions all the time. 81. G. K. Chesterton Does Some Quick Math. When someone has made you happy, they have done a great thing. They have been an influence on your overall life and helped you dwell in the now. You are full of life and love because they have touched your life in a meaningful and lasting way. Let them know that they are not forgotten. 82. Confucius Says Never Forget! When someone hurts you, it’s hard to move on. However, you must forget all the hurtful actions that others have done. When you have a friend that was not always a friend, there is some angst in the air between you. This quote can let them know you have forgiven them, and they are now a great contributor to your life. 83. 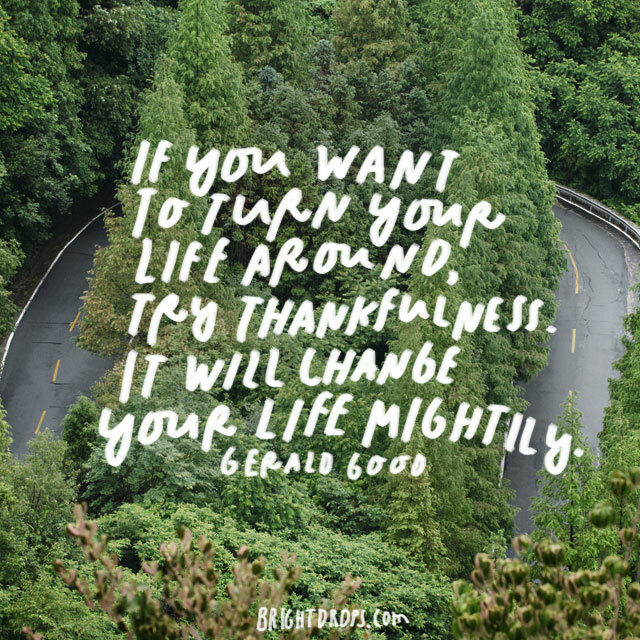 Gerald Good Can Change Your Life. When you are grateful to others, they will want to be around you more. Naturally, your relationships will change and your entire life will grow. Expressing the grateful attitude that is in your heart will only make your present state improve. 84. Toni Mont Recognizes Humanity. When you say thank you, you are recognizing that that person is indeed a person. They are not just a colleague or a casual acquaintance. Instead, they are worth something to you personally. Develop a relationship and watch it grow by having a great ebb and flow of giving and accepting instead of being stagnant. 85. Jean Baptiste Massieu Has a Memorable Heart. They say elephants never forget. Your heart never forgets either. Every positive action that others take for your well-being is a new memory to fill your heart. All those positive moments create memories that can be built upon and a relationship can grow and blossom into a lasting love between friends. 86. Gordon T. Watts Gets Deep. Giving back is the way we show that we are grateful. If you are truly grateful, show it with your actions. Instead of trying to find the right words, focus on giving back. Paying back someone with actions is always the best way to show them that you appreciate everything they do for you. 87. Walt Whitman Tells Us About His Best Friend. Everyone has the best friend that means the world to them. The two of you are like peas in a pod. Whether it’s the same silly trivia game you play or the same wild nights you enjoy, you have some bond that can’t be defined with words. This quote sums up best friends with a beauty and elegance that few can understand. 88. William Feather Doesn’t Call in Favors. It’s strange how most of the good things that people do are not done out of obligation or duty. When you need a friend the most, they come through and they expect nothing in return. Sometimes, a stranger will randomly buy you a cup of coffee with no expectation of conversation. In those instances, this quote can explain a lot. 89. 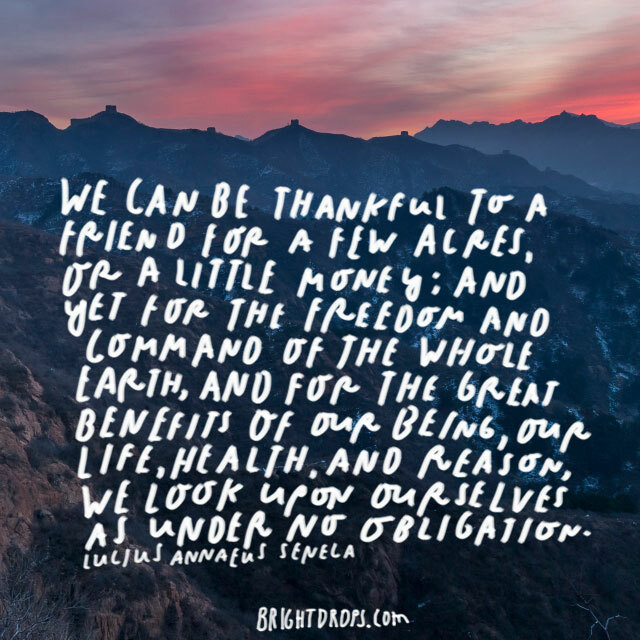 Baha’u’liah Is Always Thankful. 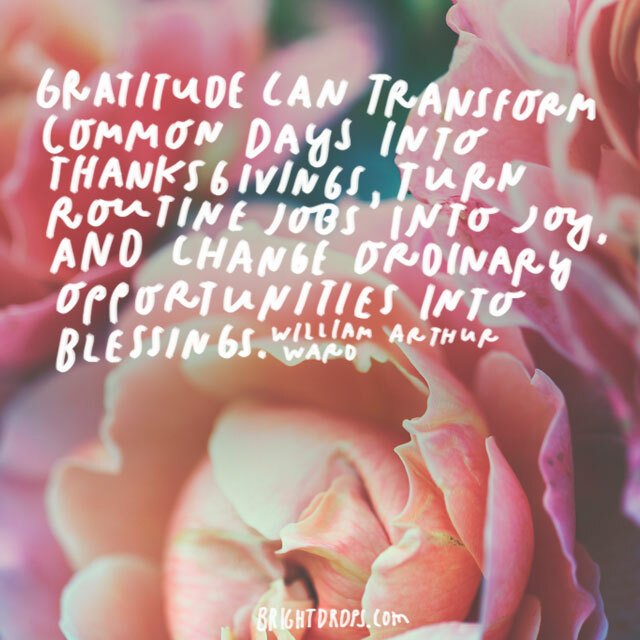 When you are grateful, it’s a part of your livelihood. You can’t please all the people all the time. Sometimes, those people simply can’t be pleased. Develop an attitude of thanks in your own life so that you are not seen as a person who is complaining. No one likes a complainer. 90. Daphne Rose Kingma Creates Love. When you are grateful, you are building love within a relationship. Love can only multiply. It never divides, it never subtracts. When you are grateful, you are showing the other person that you care about them and that you care about your relationship with them. This is an essential part of building a relationship. 91. 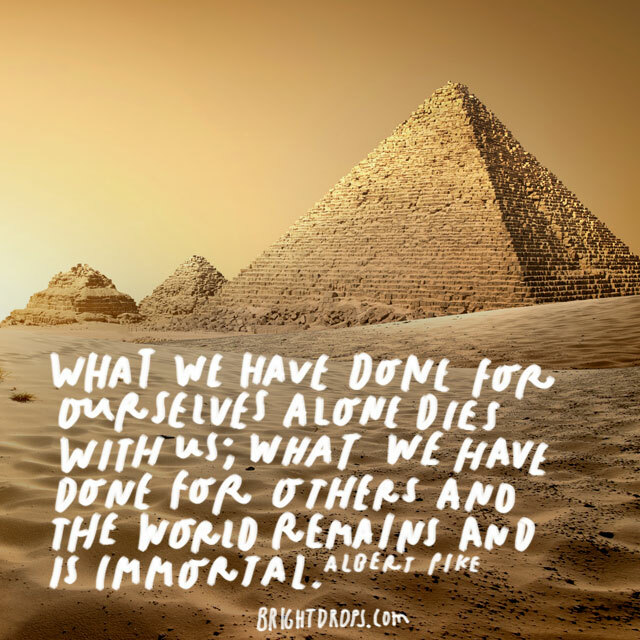 Albert Pike Is Immortal. This quote is brilliant. When someone goes out of their way to do something for you, it is a great addition to the world. Let them know that they have done a great deed that will remain as a part of their legacy. When you live life with others in mind, you never actually die. You’re reputation lives on forever. 92. Emerson Wakes Up with Friends. Some days, we just feel a massive appreciation for those people in our lives who have helped us along the way. There aren’t words that can truly express that emotion we feel, but taking the words of the Father of Transcendentalism is a great start. Show them they have helped you rise above and see things in a different way. 93. Edwin Arlington Robinson Has Two Kinds of Thanks. The best type of gratitude is for giving to others. We feel so grateful that we can be a blessing. We feel more blessed to participate in their life than we do for what they give to us. It feels so great and so fulfilling to be a part of someone else’s success and happiness. Never more than when that person matters to us. 94. 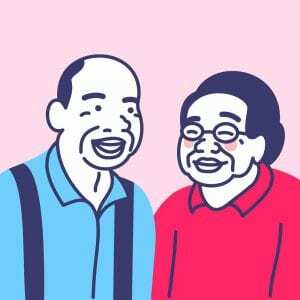 A Malayan Proverb of Kindness. Kindness is something that cannot be measured in gold or silver. 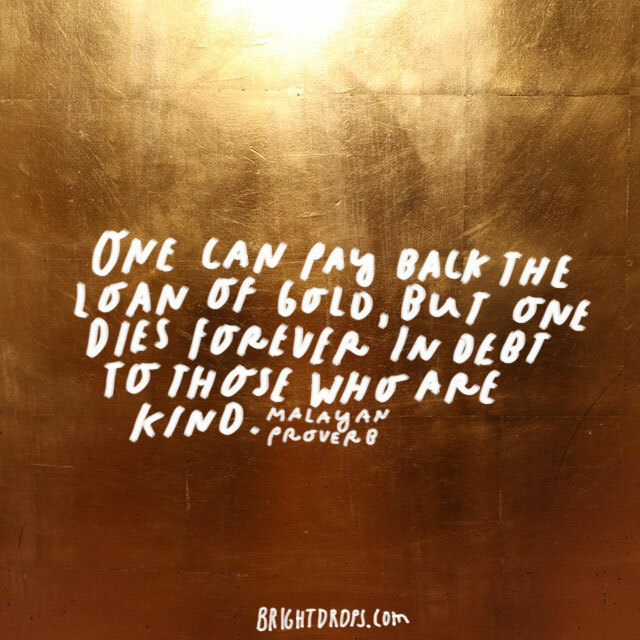 When others are kind, we are forever in debt to them. Let them know that they are loved and appreciated for everything they do to make your life better. The truth is that you can never pay them back but you can always be kind to them in return. 95. Lionel Hampton Remembers with His Heart. The heart is like an elephant. Let others know that you’ll never forget what they have done to help you or to just show you love. We can’t express all those emotions and feelings that are in our heart, but it never hurts to try. 96. Mark Twain Is a Polyglot. 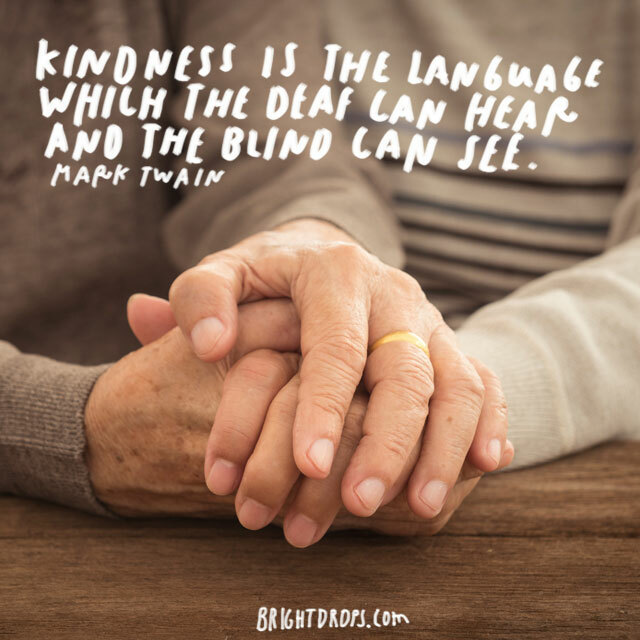 When someone is kind, it speaks volumes. You could fill volumes of books with the kind acts that others have done and how they have changed your life. Mark Twain puts it in simple terms but explains just how powerful those simple and kind acts are. 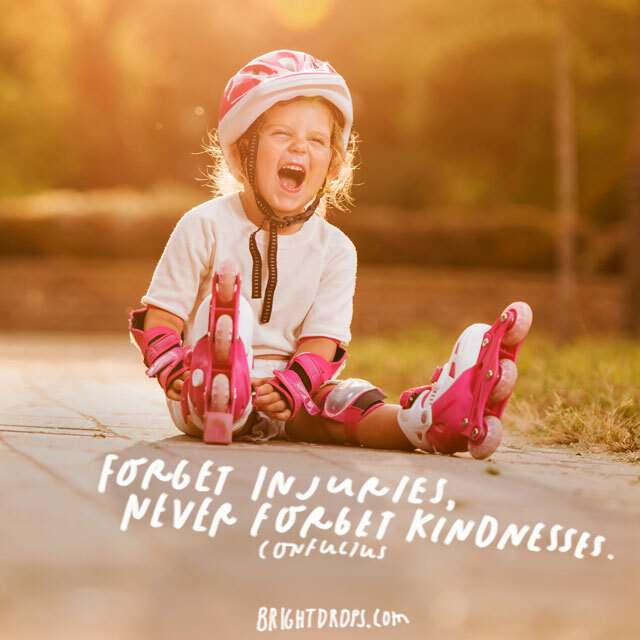 Kindness can knock down barriers, especially barriers in a relationship. 97. Oscar Wilde Appreciates the Small Things. Whether you intend to do good or great does not matter. When someone actually reaches out and does something kind, it means the world. Someone buying you a cup of coffee or a small trinket can matter more than someone who wants to buy you a house but never does. 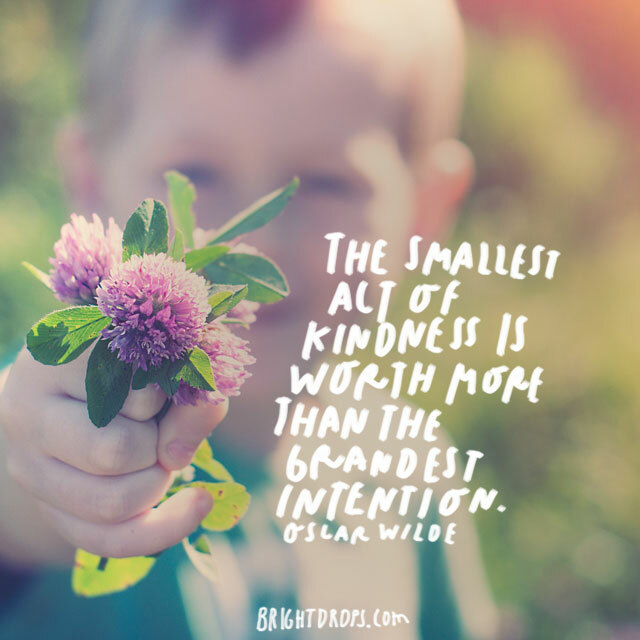 Showing you small bits of kindness are priceless. 98. Benjamin Disraeli Doesn’t Overlook Anything. A very simply thought that can easily become our mantra. In life, it is so simple to take things for granted. If we don’t take things for granted, we will be more grateful. More than half the world’s population doesn’t even have an Internet connection. Many more are still on a dial-up connection. In the wealthy developed West, we are spoiled. 99. Voltaire Owns It All. When you acknowledge what others have done, it helps you have the same quality in yourself. You can suddenly become more giving just by recognizing the great things others have done. Don’t be afraid to say thank you for little things, medium things, or big things. When you show others that you love them and appreciate them, your life improves. More importantly, your relationships grow.